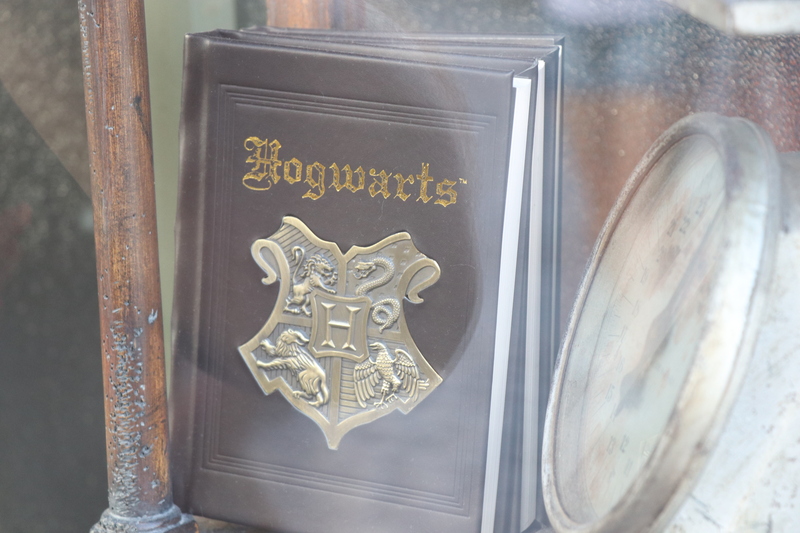 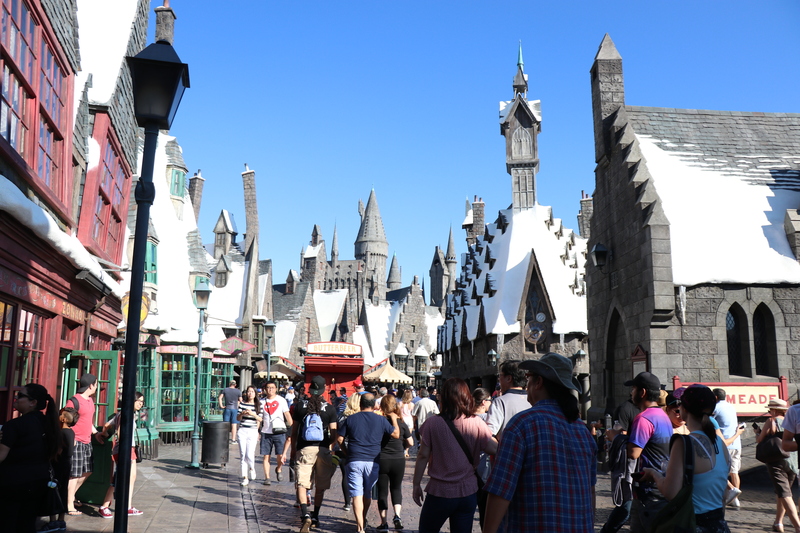 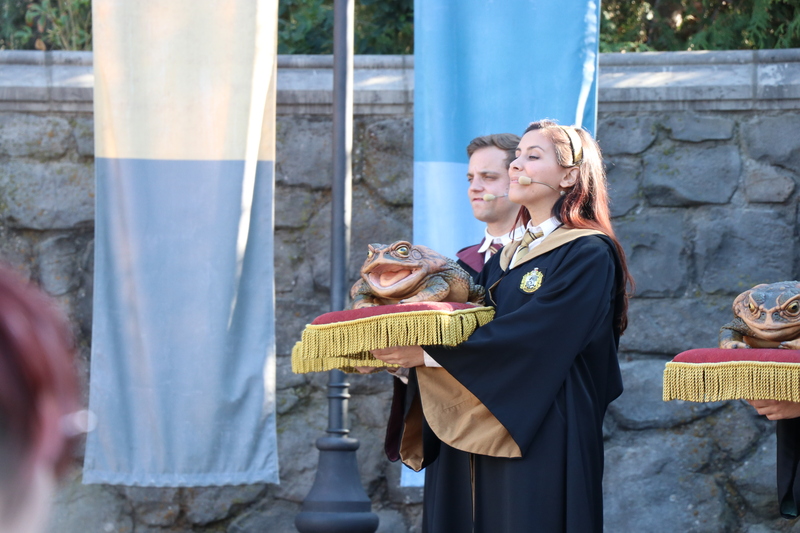 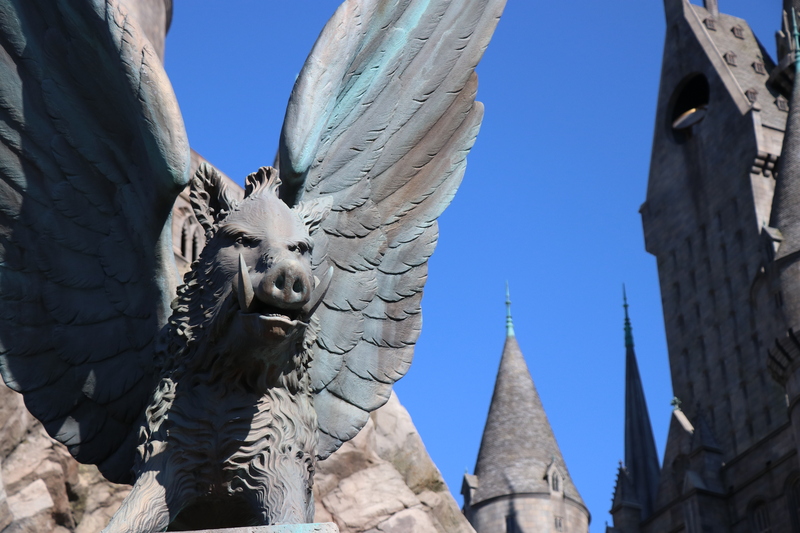 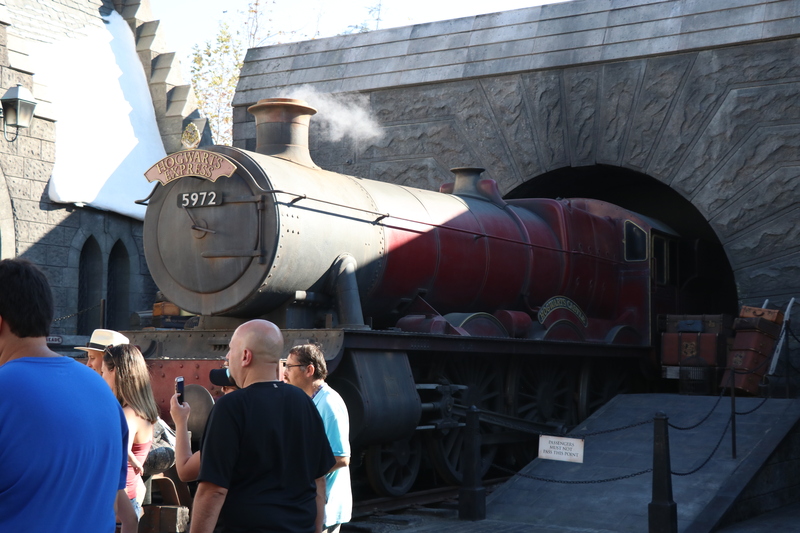 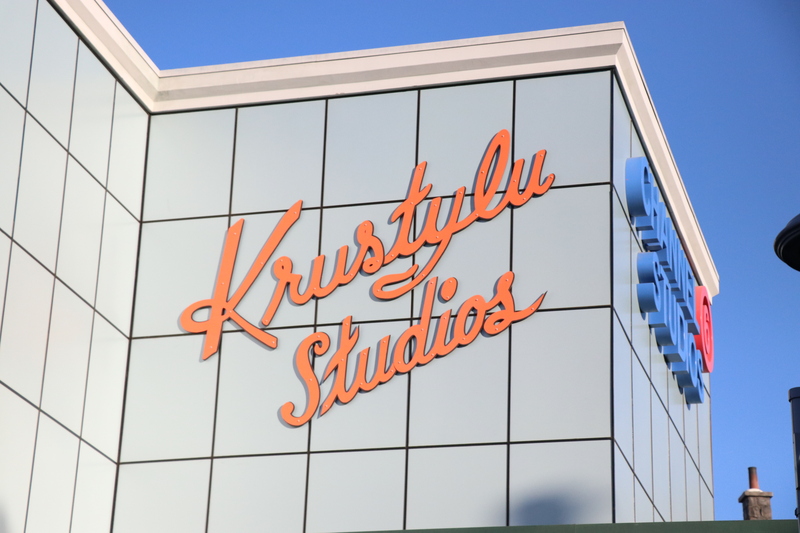 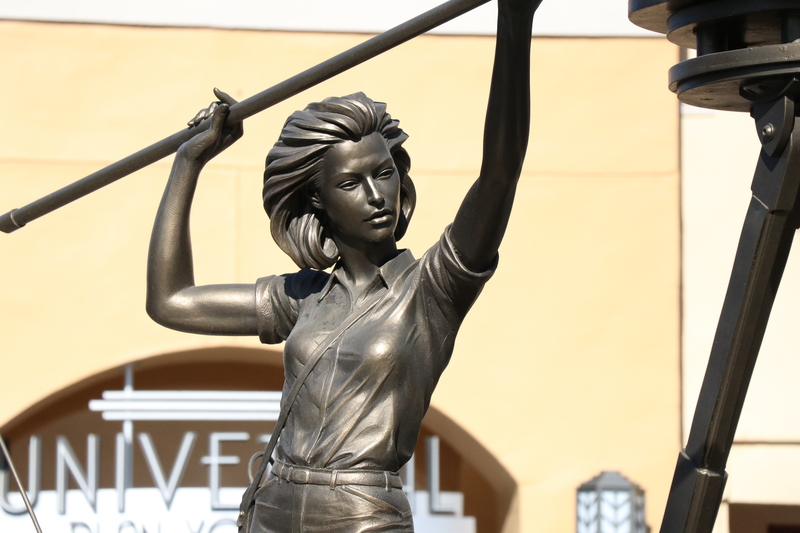 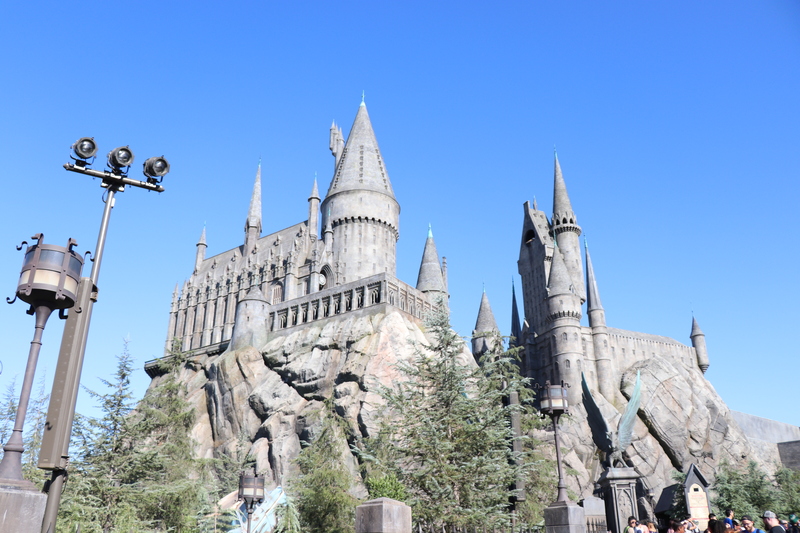 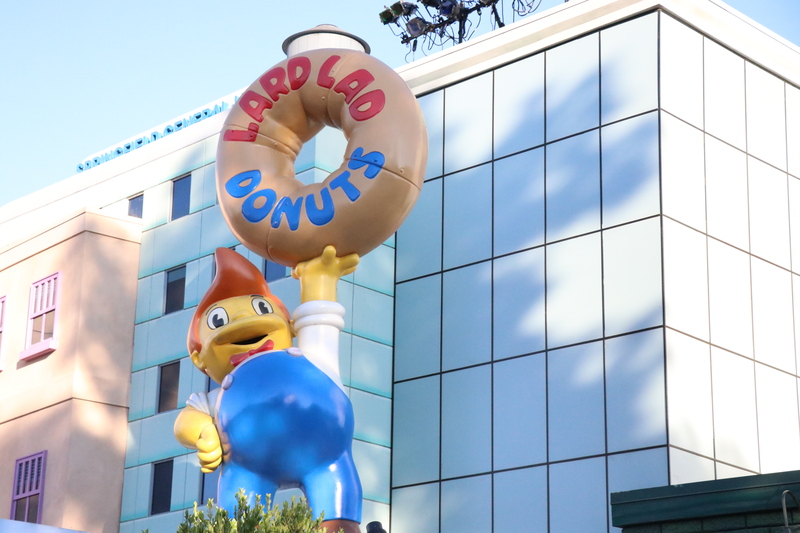 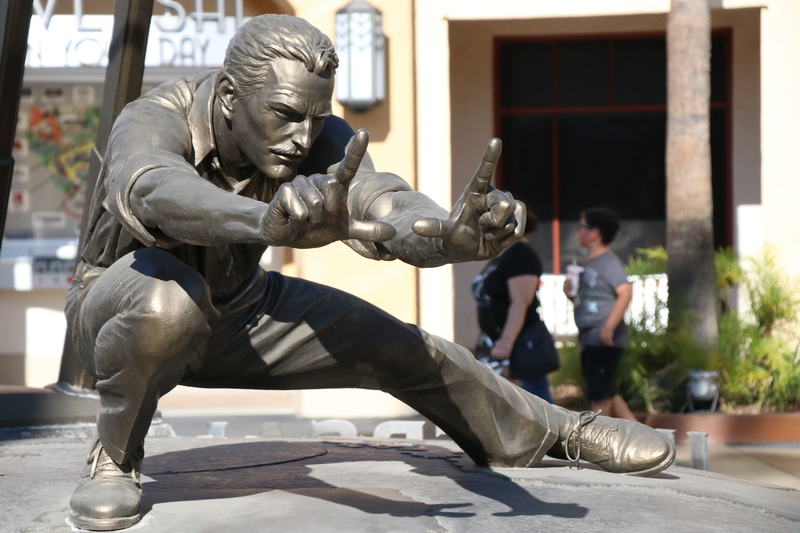 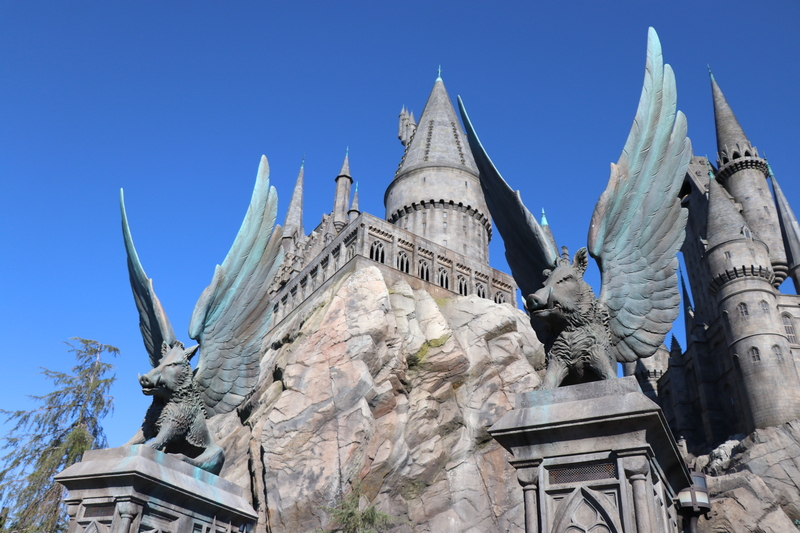 We visited Universal Studios Hollywood this past weekend and this is what we saw! 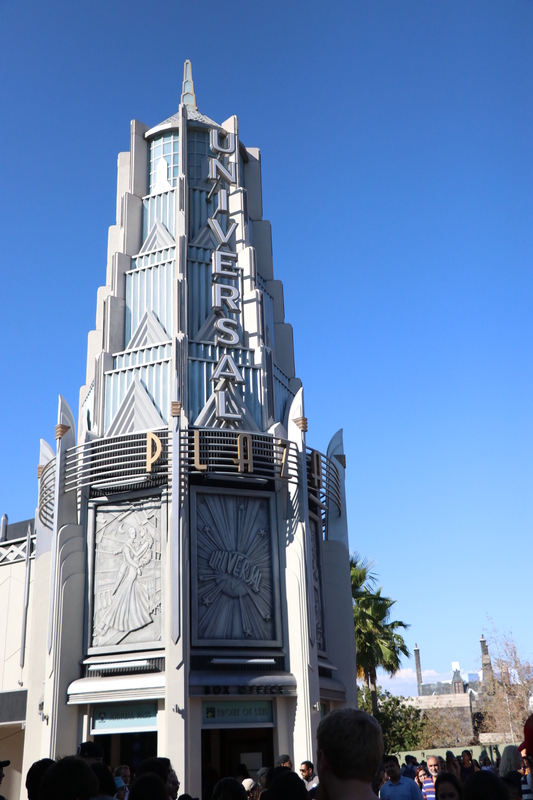 After passing the turnstiles and looking down the main entrance of USH, it is easy to see there is a lot going on. 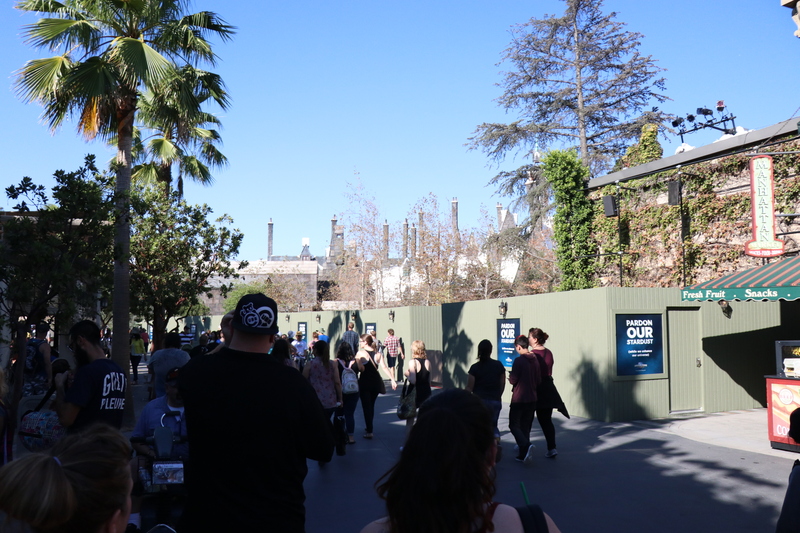 In the distance you can see the construction of a brand new building. 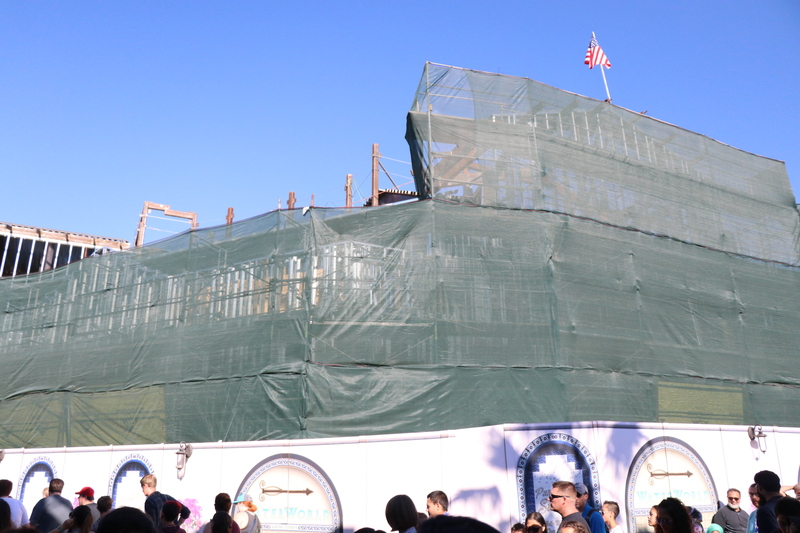 Not a huge fan of the placement and size of this new building. 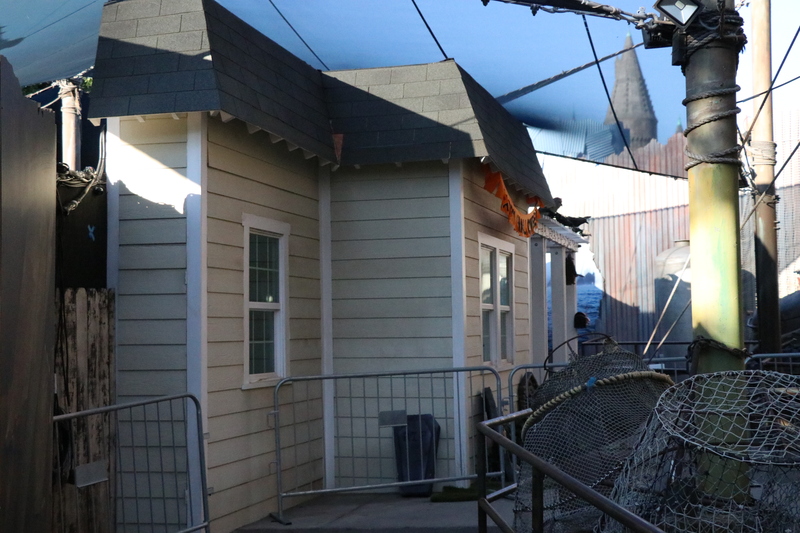 Before, the building was set a bit back giving more room. 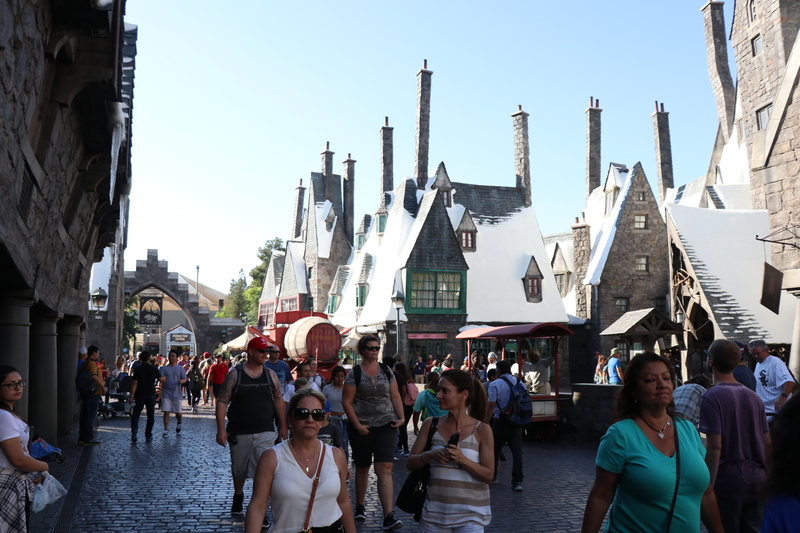 Now it feels like its a bit more intrusive and can only cause problems on extremely crowded days. 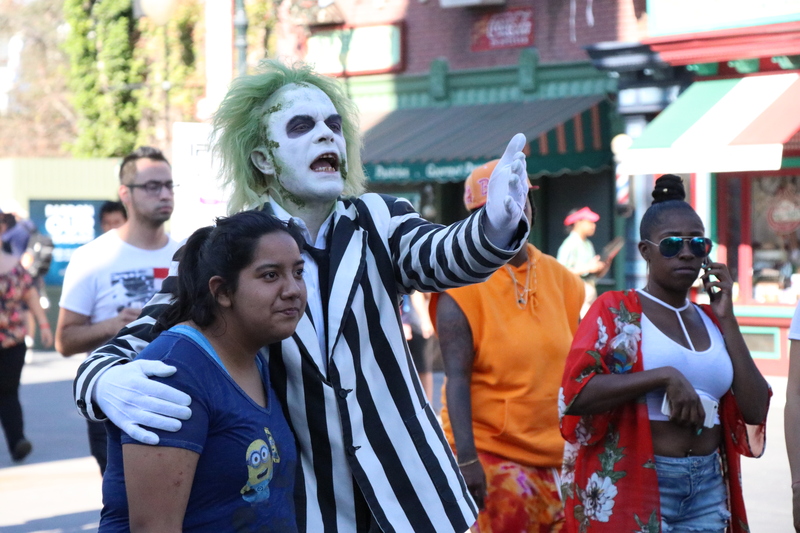 Especially Halloween Horror Nights. 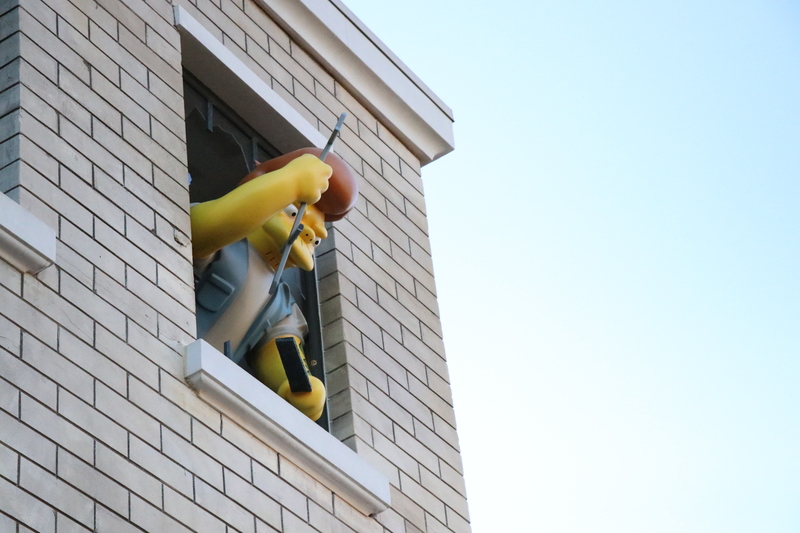 BYE BYE SHREK! 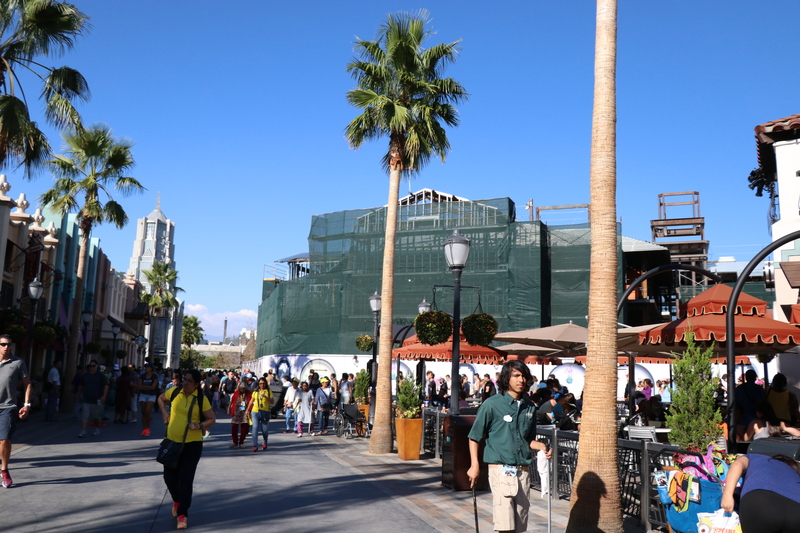 Universal took no time taking down the signage and many other things that were visibly related to Shrek. 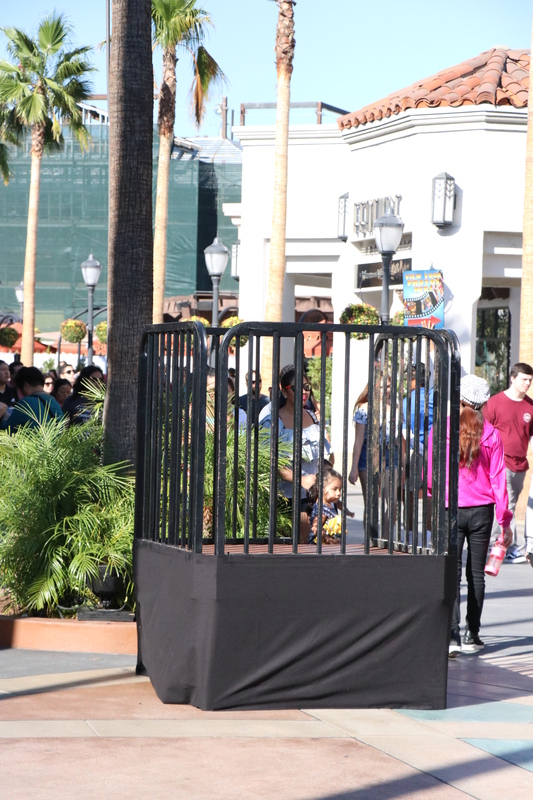 But the Shrek meet and greet with Donkey and the green ogre himself has been moved across the street. 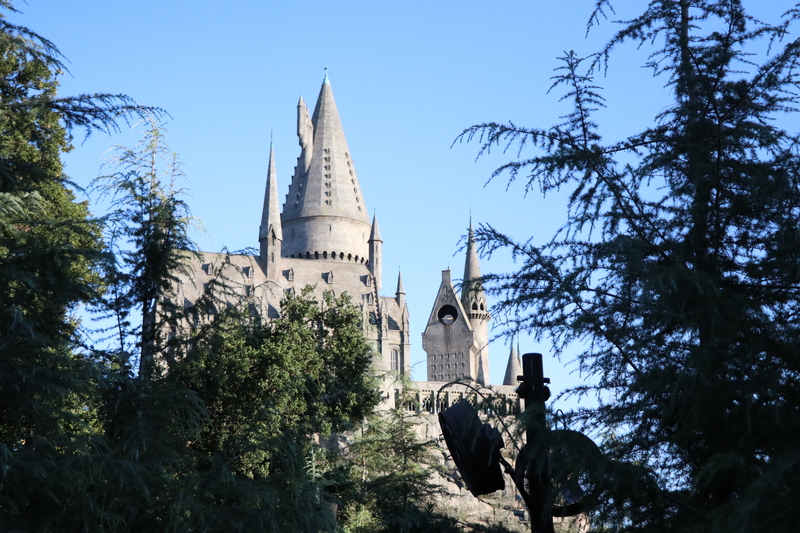 Next time you find yourself in the Wizarding World and have some extra time, I implore you to grab a butter beer or a real beer and relax with a beautiful view of Hogwarts Castle in the distance. 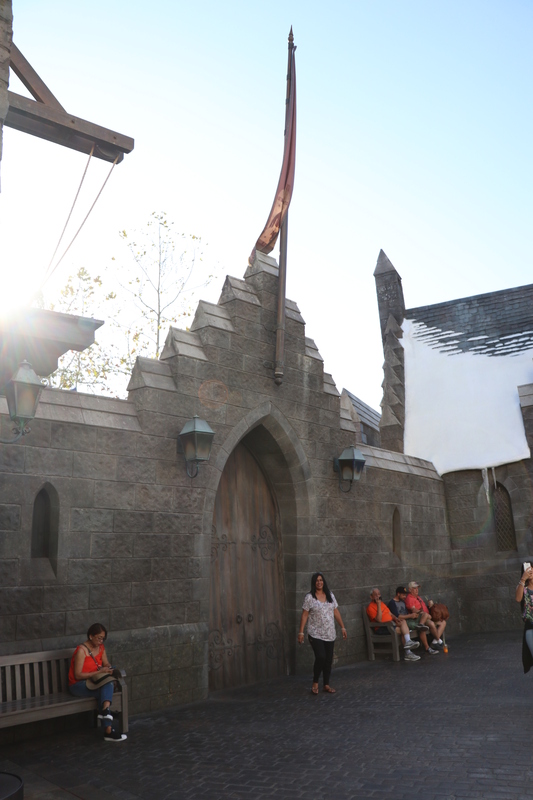 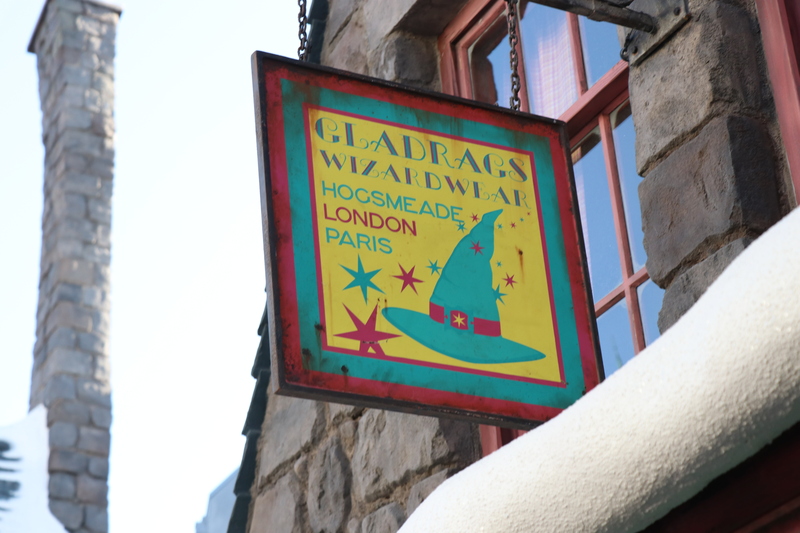 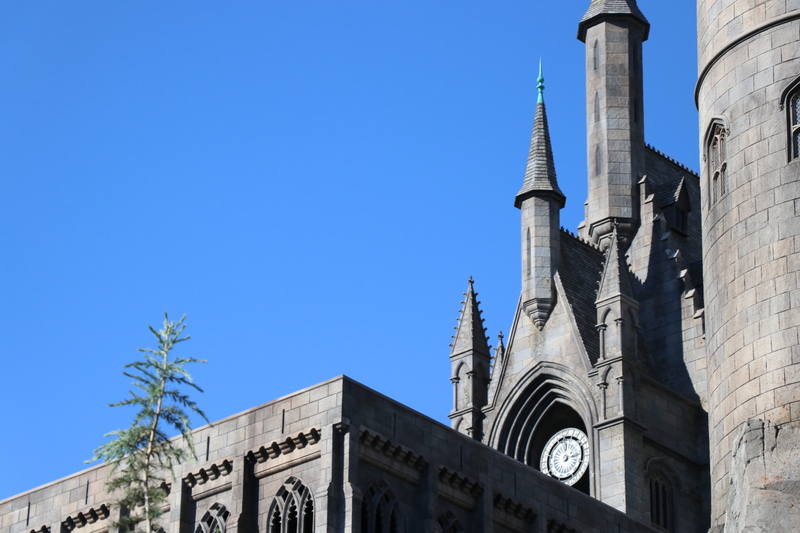 Now our Hogsmeade and Orlando’s are much more similiar with the closing of Dragon Challenge (Dueling Dragons). 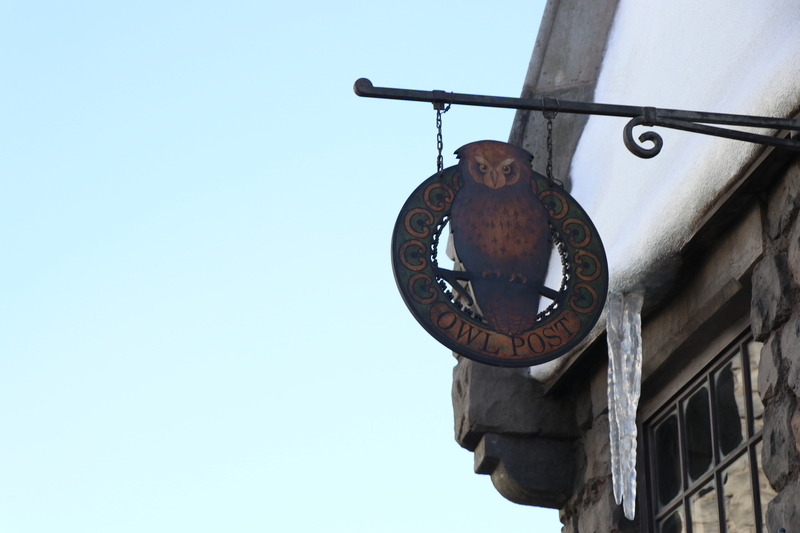 But Nikki made a very astute observation when we were there! 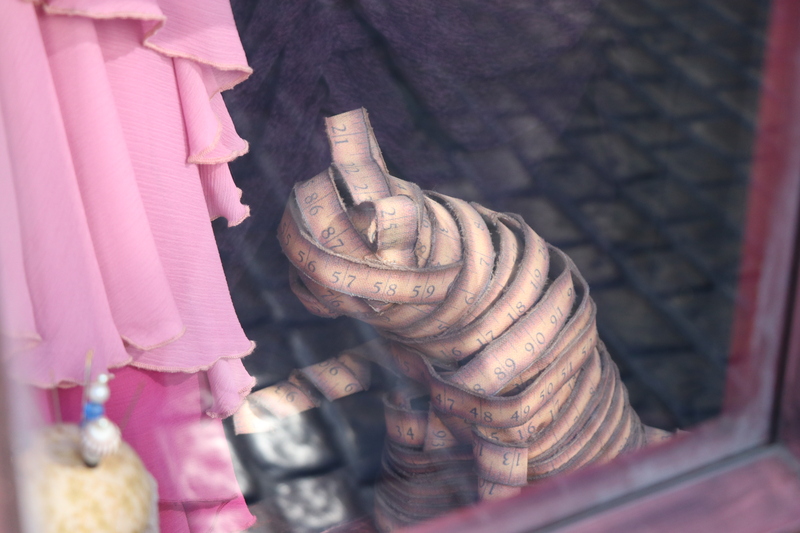 She said “Since there is a door, it needs to lead to somewhere with Shrek closing!” So by that logic, expect something in the future! 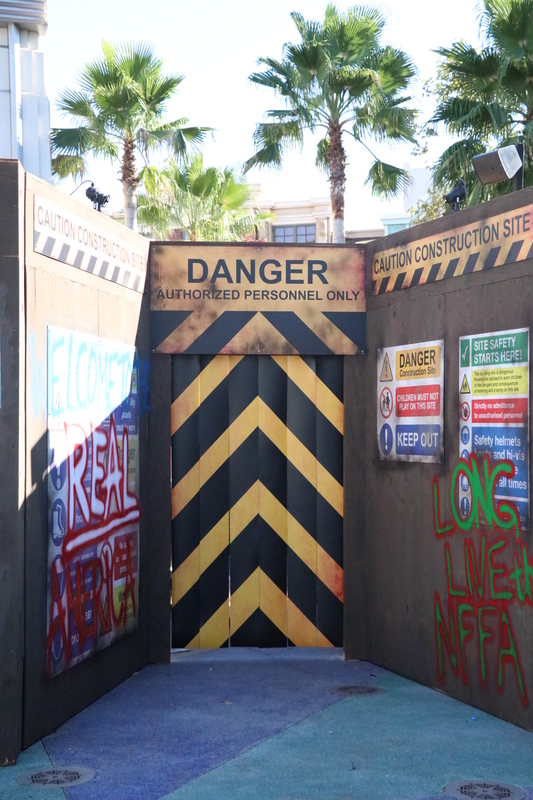 With the construction of Titans of Terror for Halloween Horror Nights in the main Waterworld Queue, the line goes to the right of the construction. 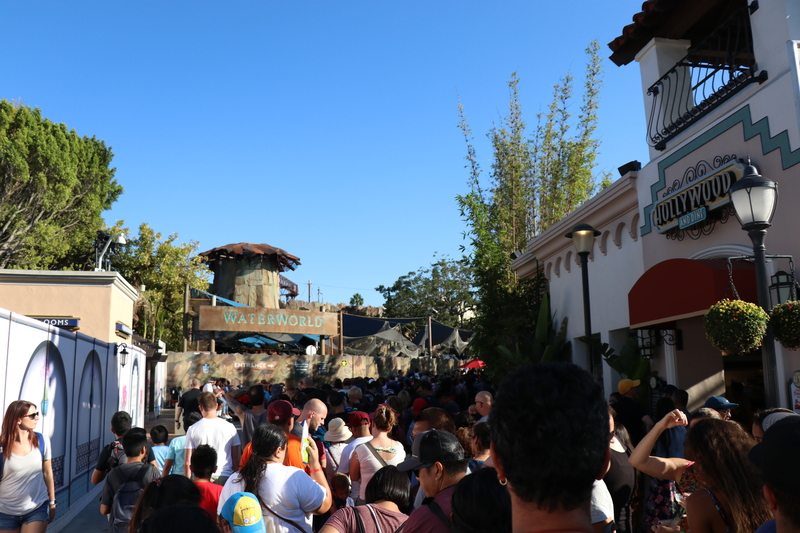 Because it was not built for this, the area quickly becomes jammed with people waiting to get into Waterworld. 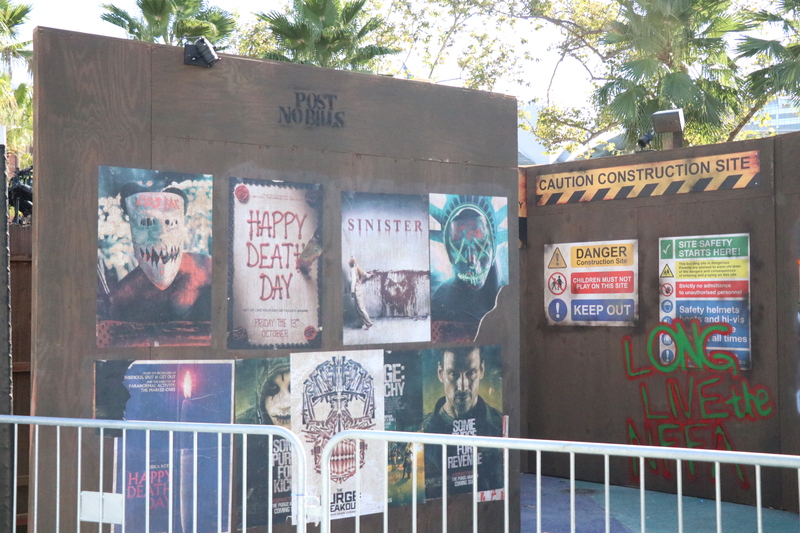 Even though there are more construction walls with the new building going up not too far off, I can imagine that this will be a familiar sight during the HHN seasons. 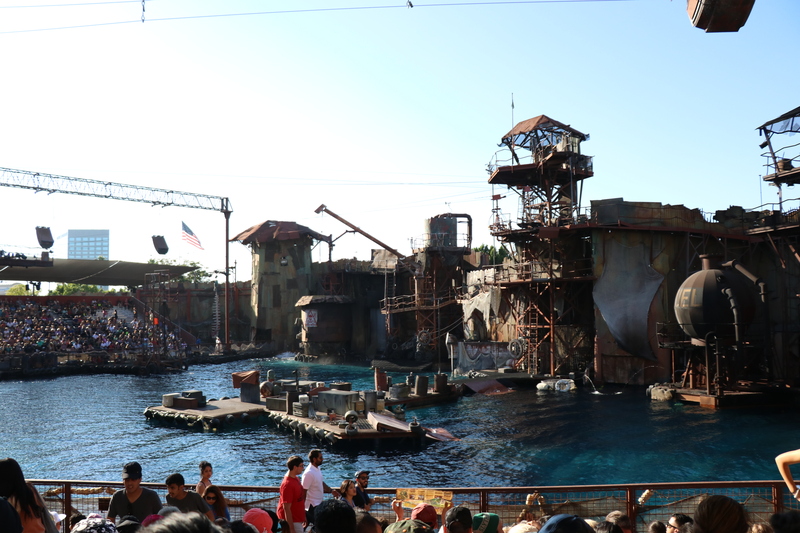 With that being said, I always think that Waterworld is worth it! 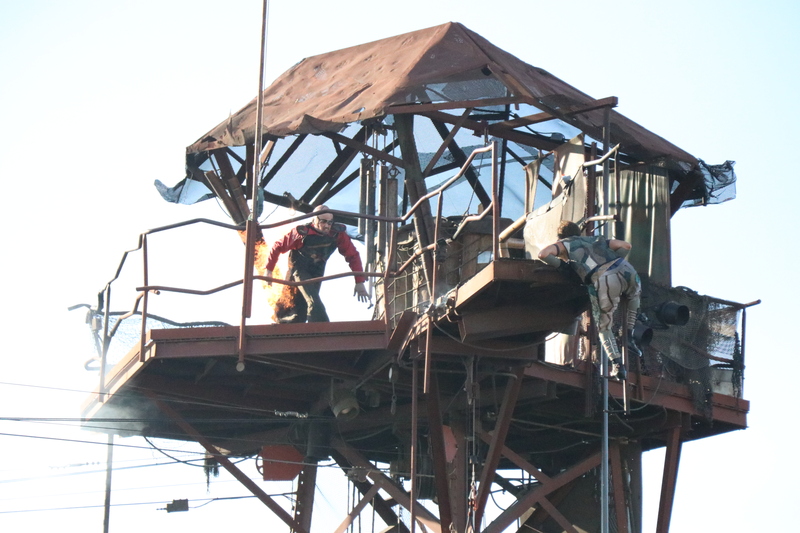 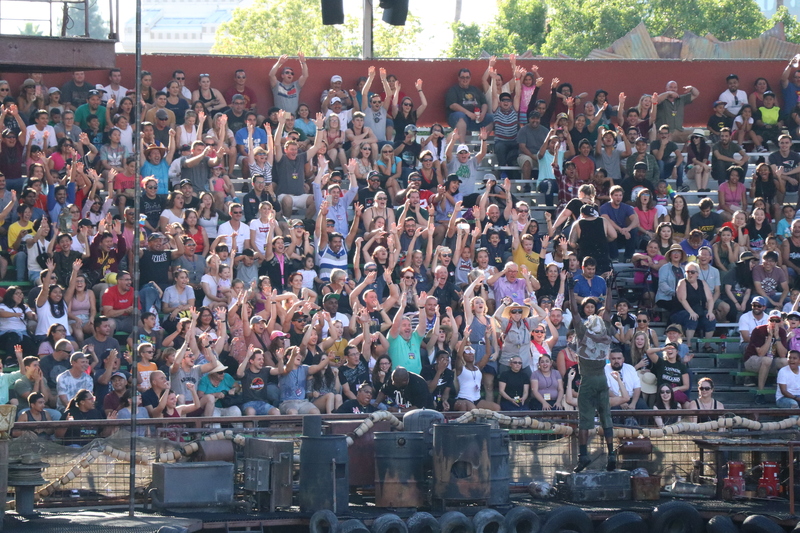 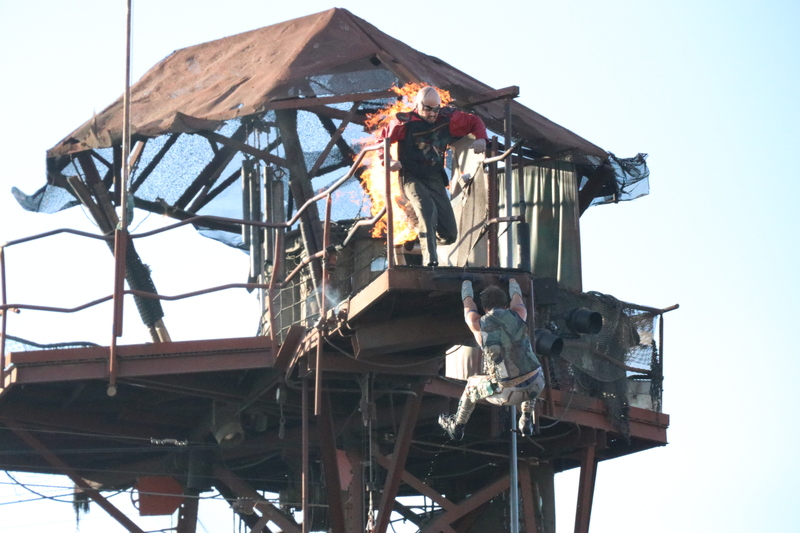 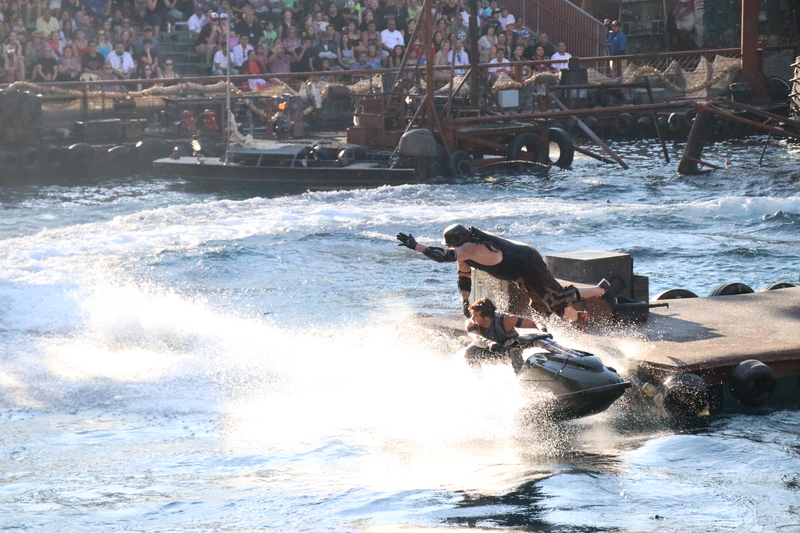 It is single handedly our favorite thing on property as well as the best stunt show we have ever seen! 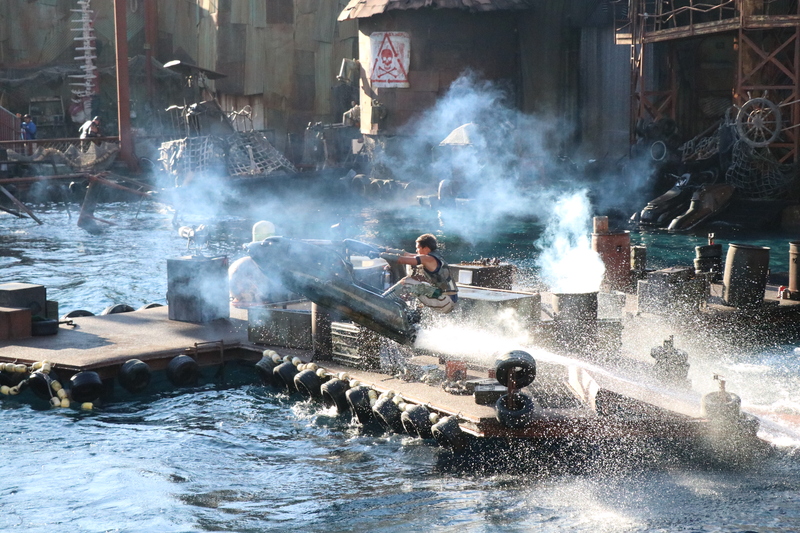 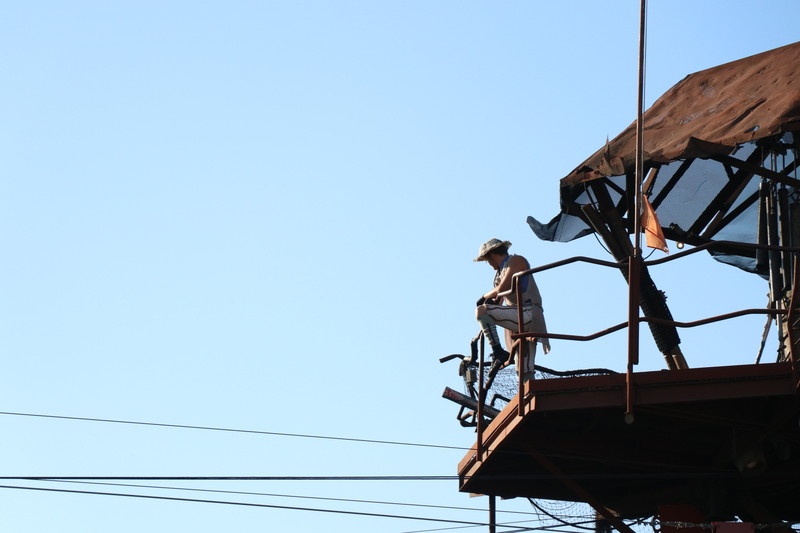 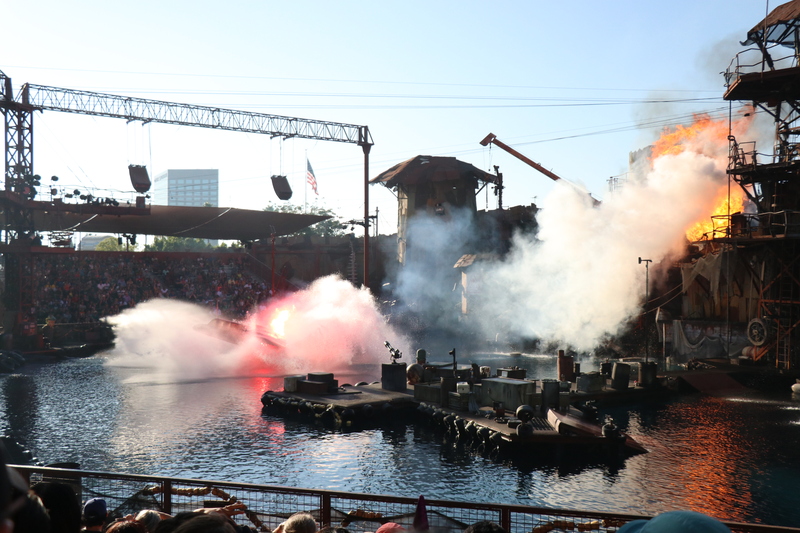 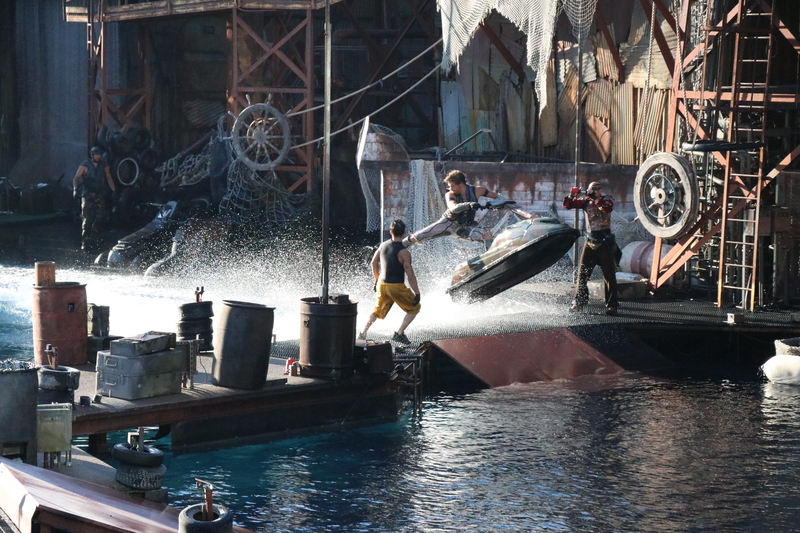 If you have never attended a show of Waterworld, these are some stuff you can expect. 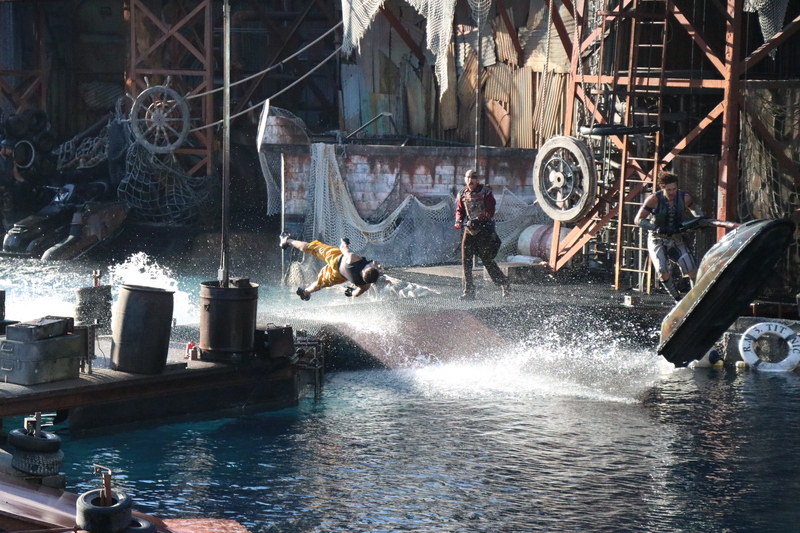 If you do not want any of that to be spoiled for you, SKIP THIS PART! 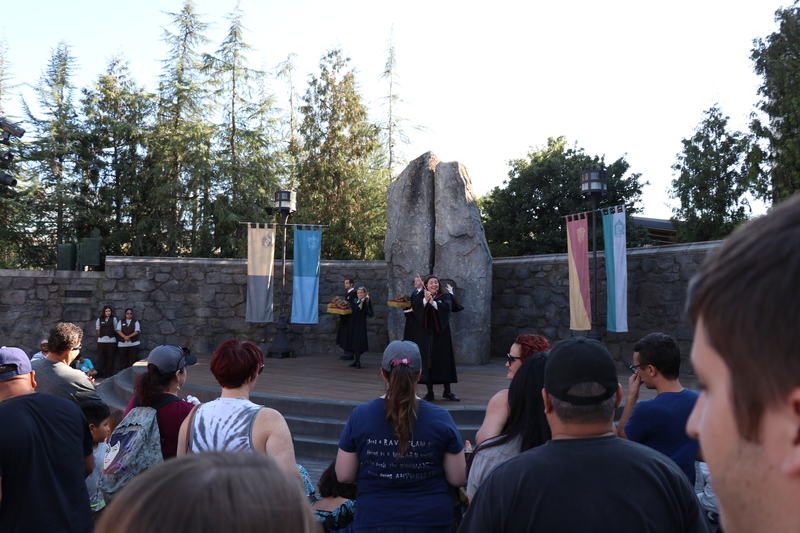 Some of the wonderful characters entertain guests before the show starts. 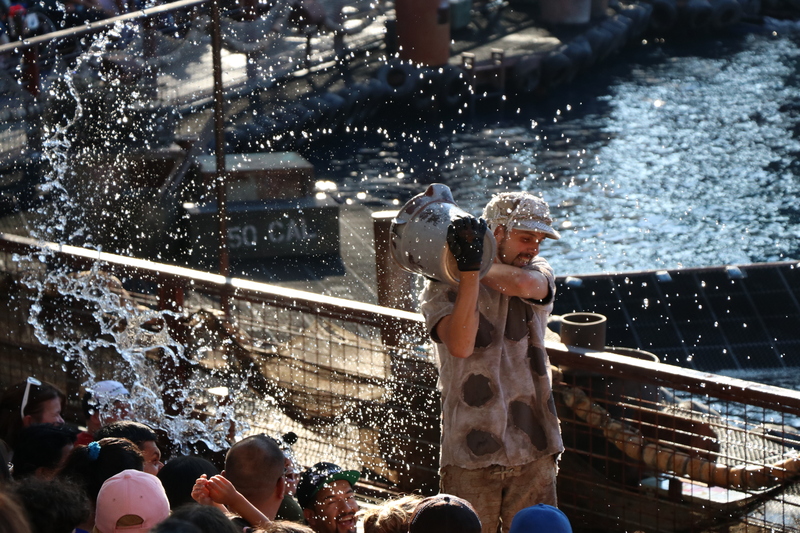 When I say entertain, I mean completely drench and soak guests. 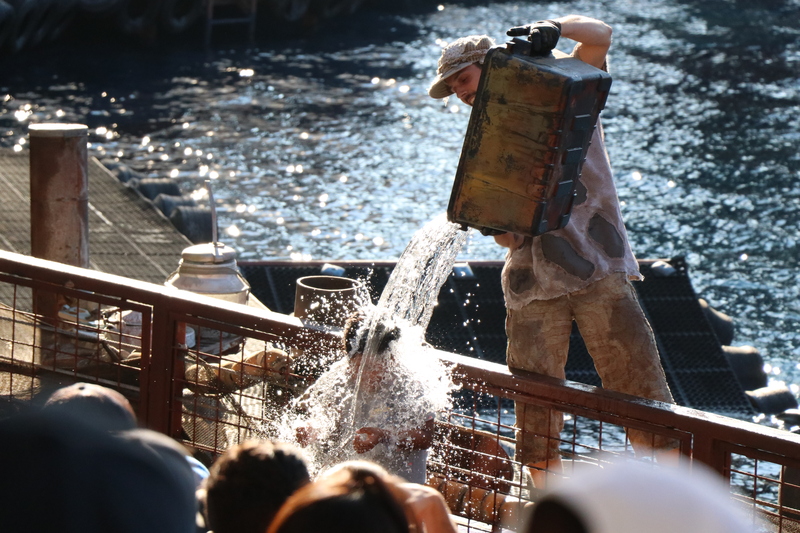 It is the best and quickest way to cool off during a hot summer day. 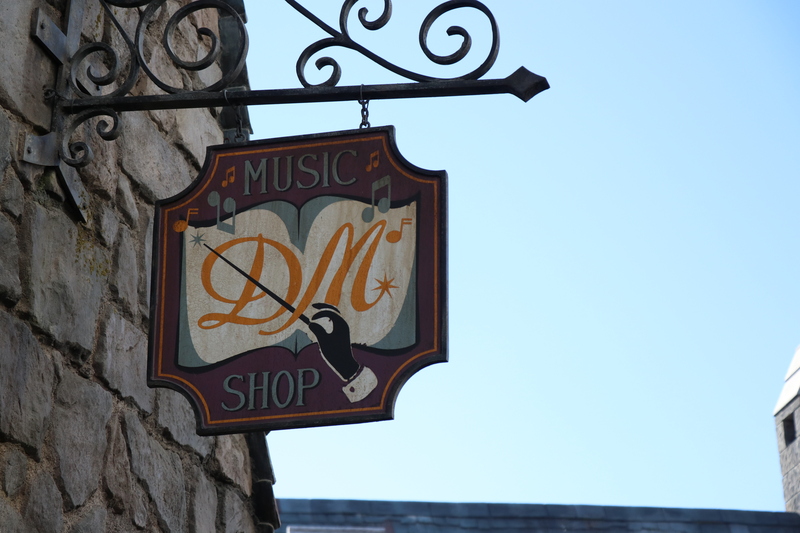 If you ask for it, they will quickly and happily oblige. 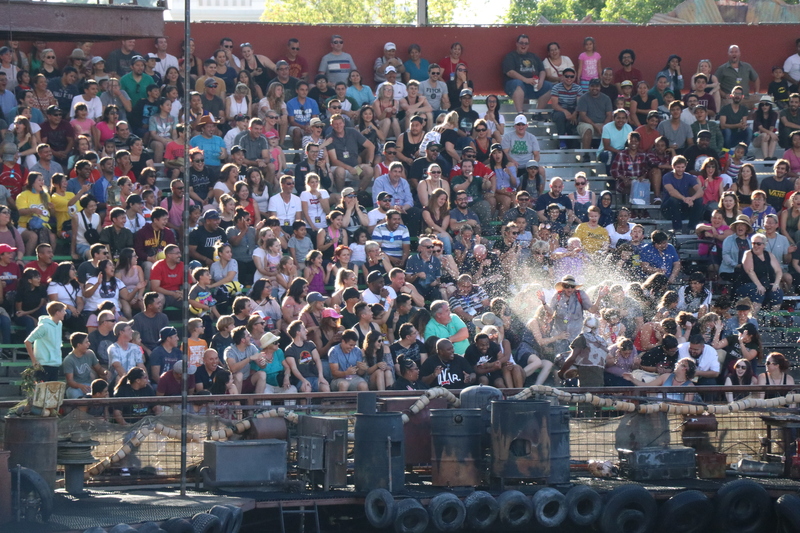 This kid got WAY more wet than he was expecting! 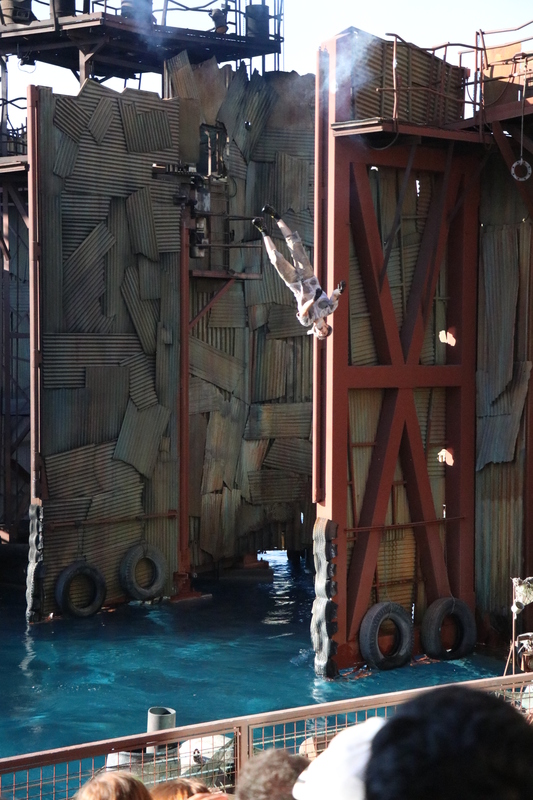 This is the part of the show that I find to be the most jaw dropping. 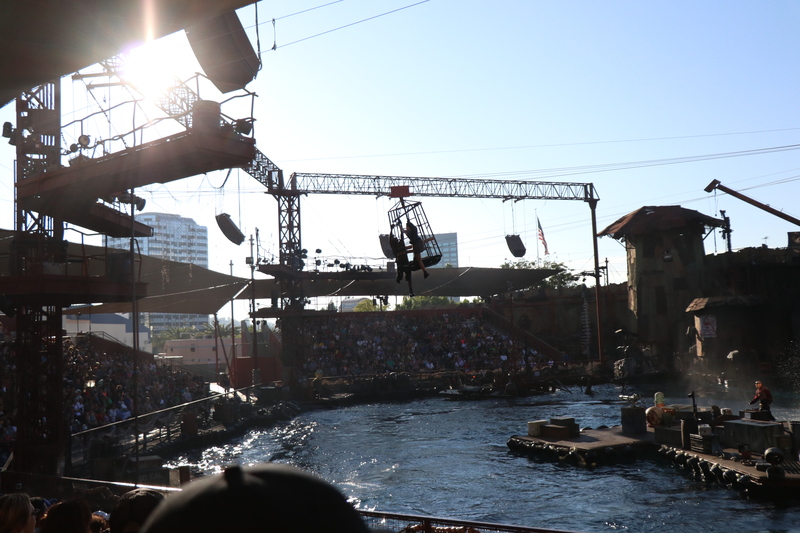 They catapult a plane into the show! 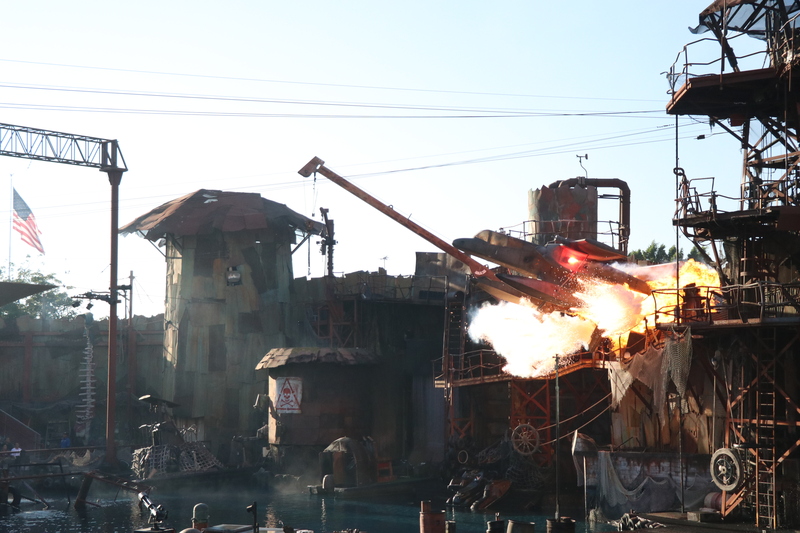 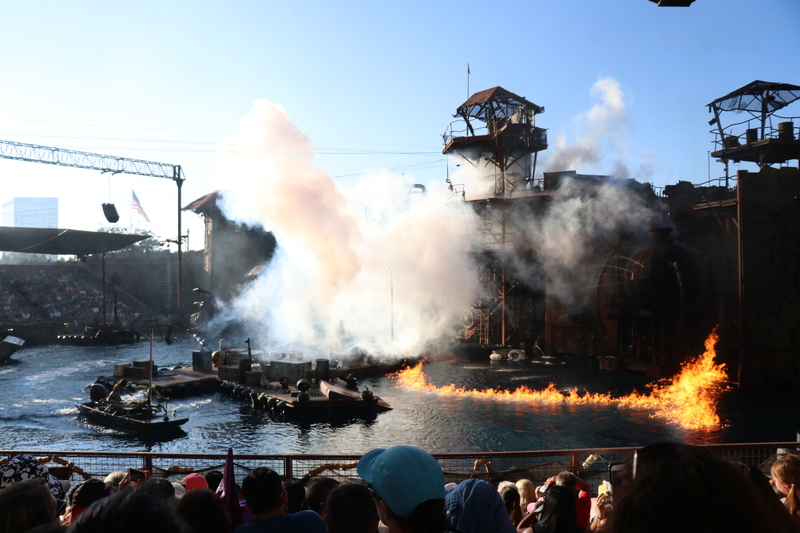 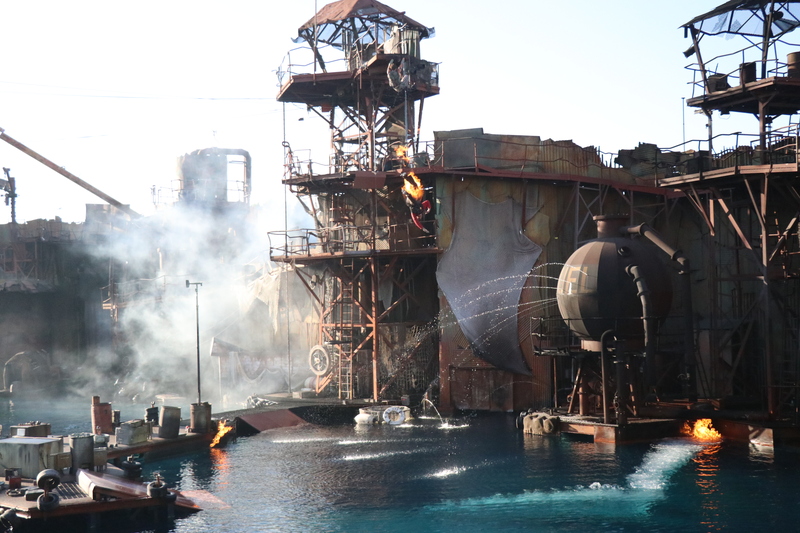 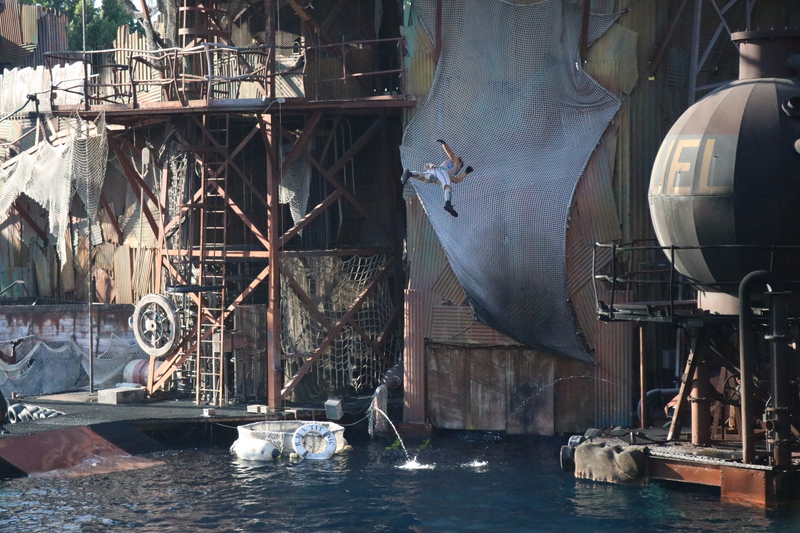 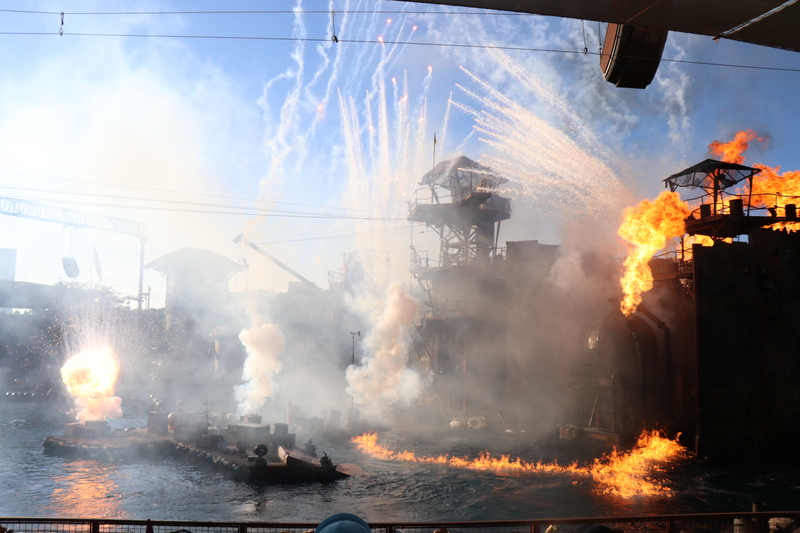 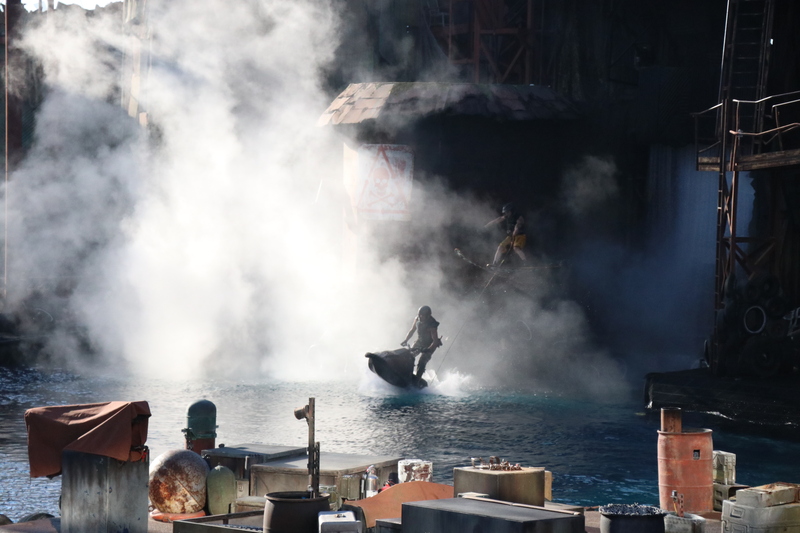 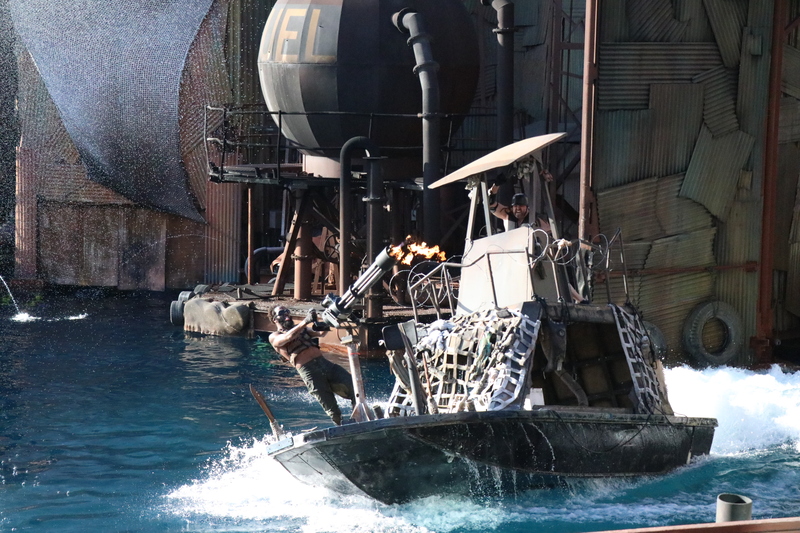 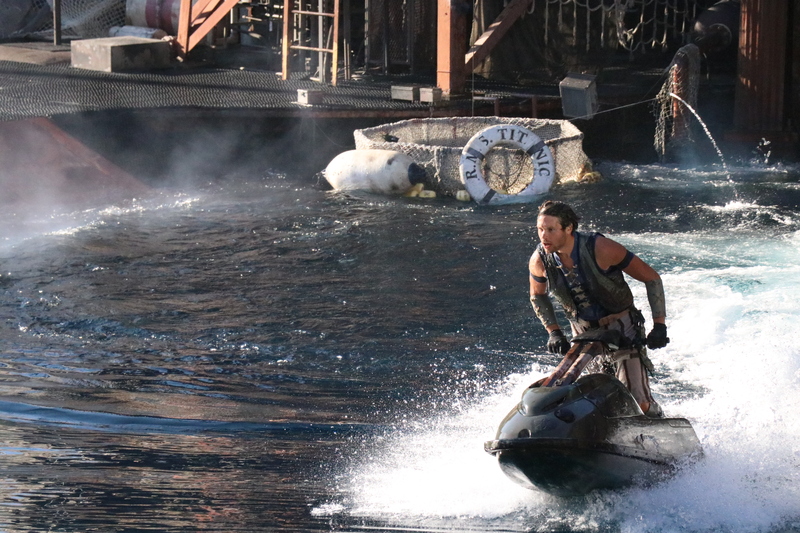 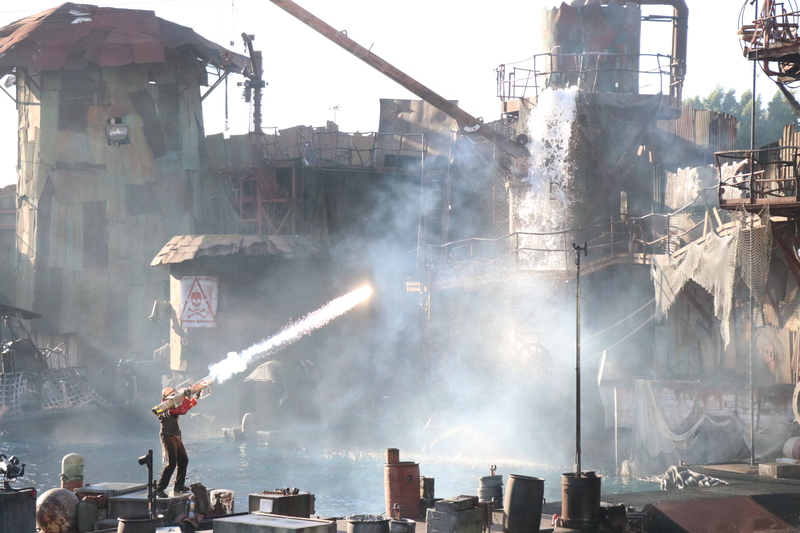 If you have never seen Waterworld at USH, do yourself a favor and see it soon! 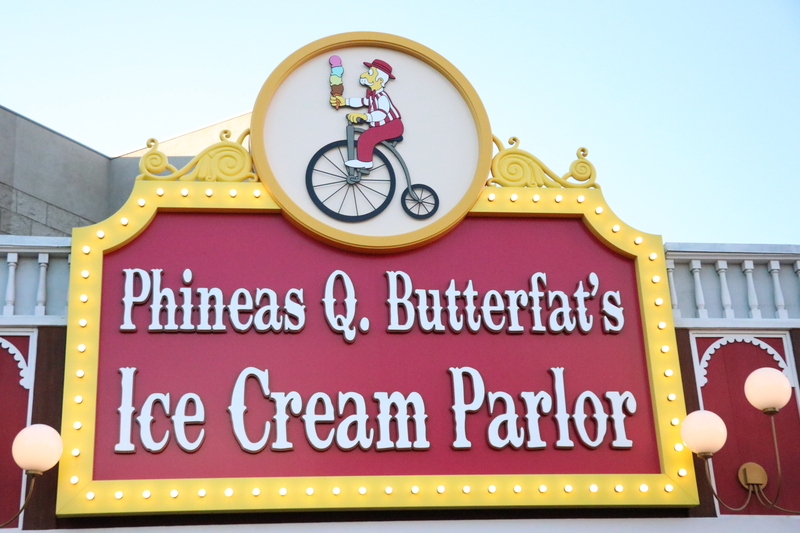 It is such a staple of the park and with the ever swirling rumors of it closing, doing it sooner rather than later will always benefit you. 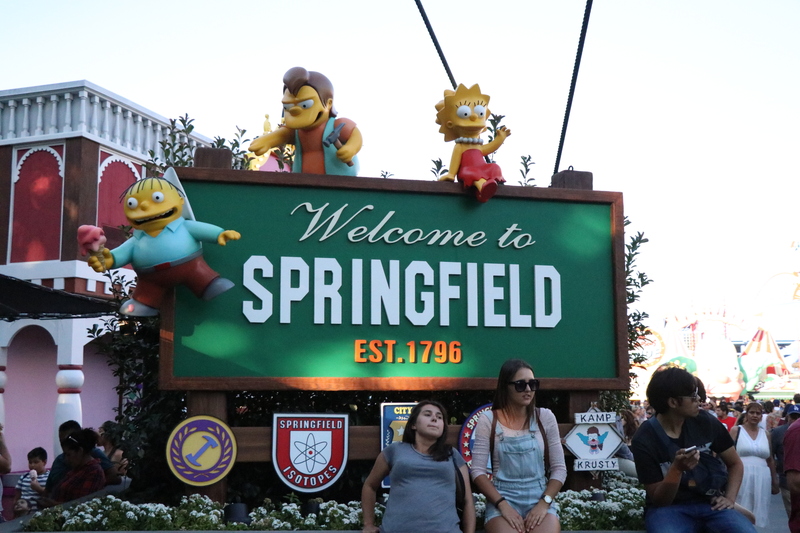 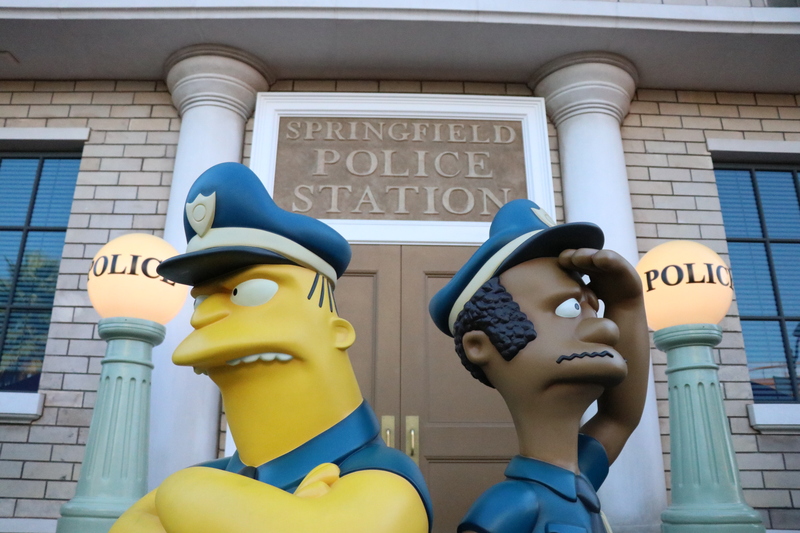 Being a life long fan of the Simpsons, walking into Springfield is a dream come true! 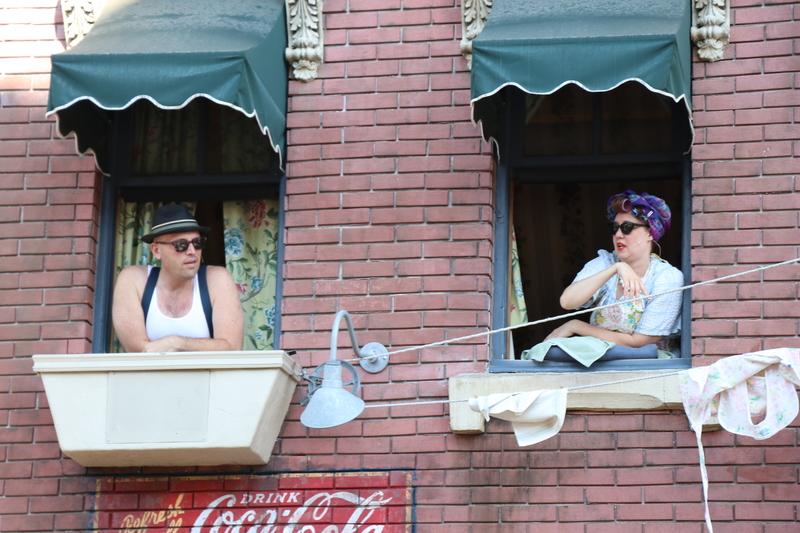 Listening to the wonderful score of the show, along side familiar sights and characters. 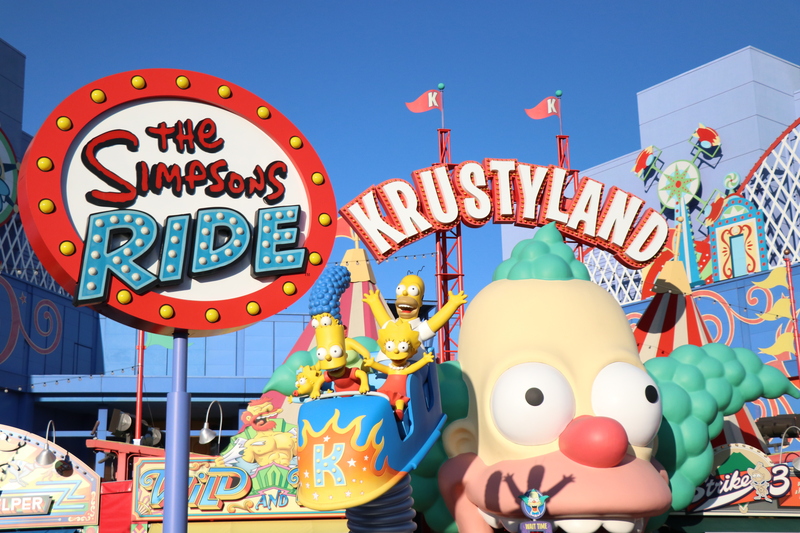 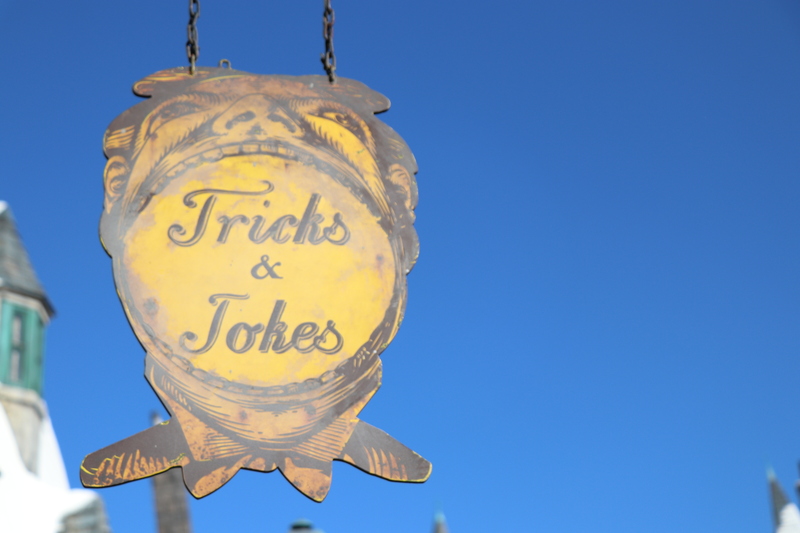 Not to mention that this area is home to a pretty fun ride filled with so many inside jokes (to the show) it will make your head spin! 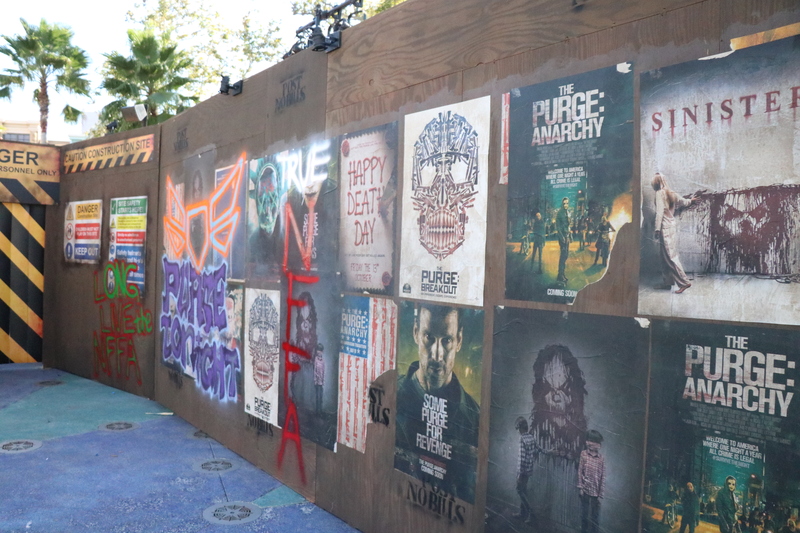 We are days if not weeks away from the start of Halloween Horror Nights! 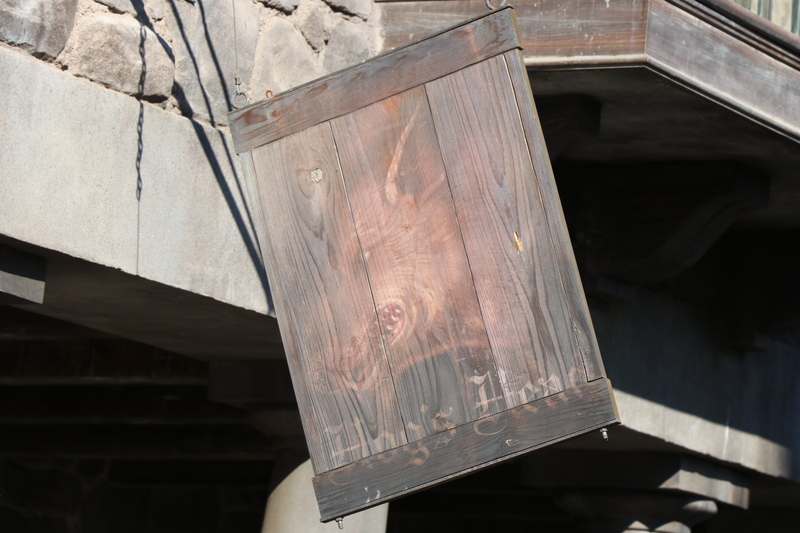 The construction is slowing down and scenic is going full speed ahead to create your worst nightmares for this years event. 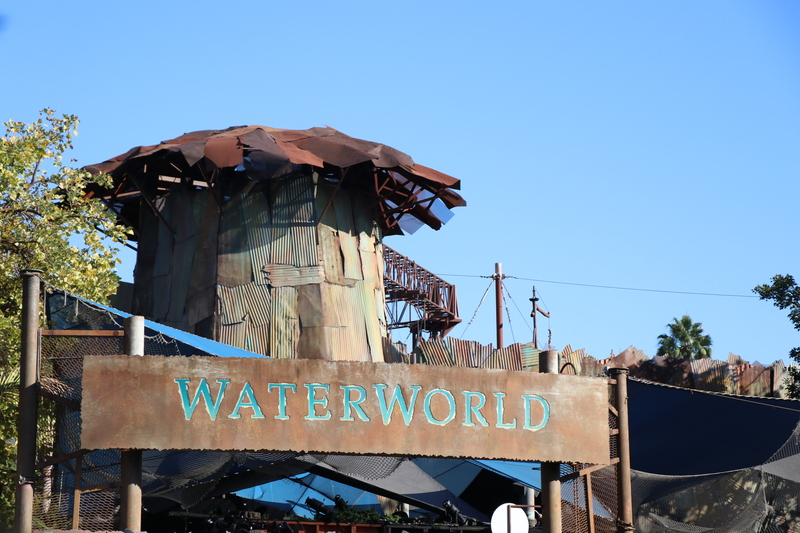 This is the facade for the Titans of Terror maze (in the Waterworld Queue) which looks to be themed to Halloween night or just classic Halloween. 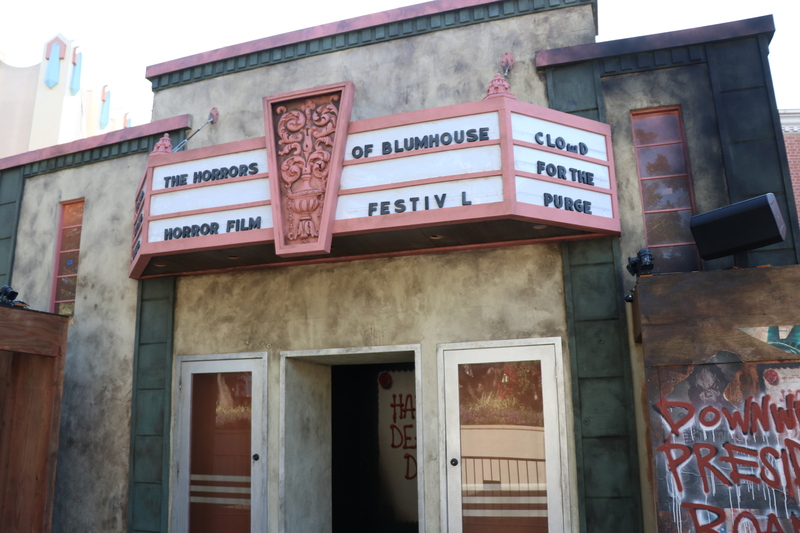 Next up is The Horrors of Blumhouse maze which starts in the Universal Plaza, where most of the famous characters appear for Meet and Greets! 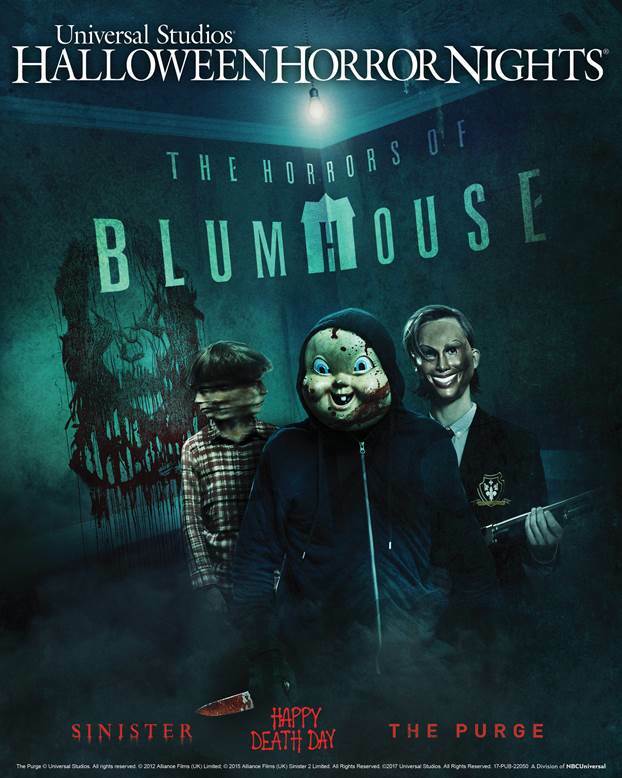 By the photo, it looks like we are arriving to this theater on the night of the Purge and first thing up is Happy Death Day! 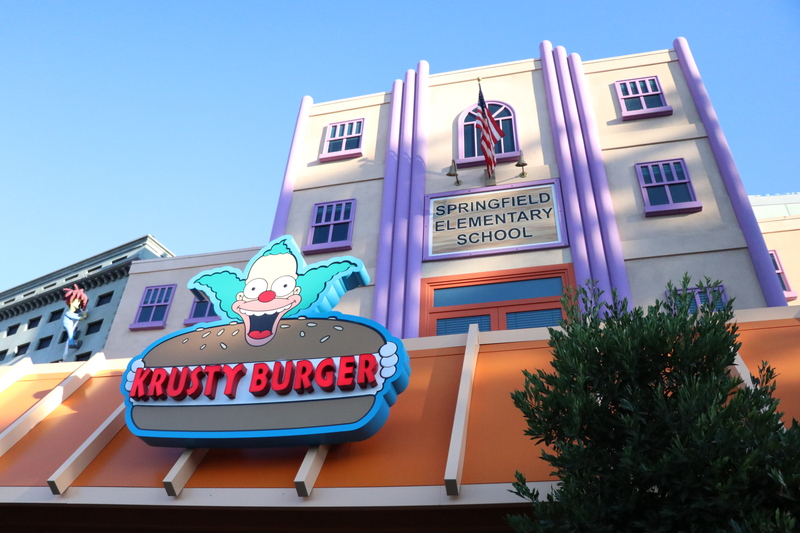 To be honest, this is on the lowest of our list. 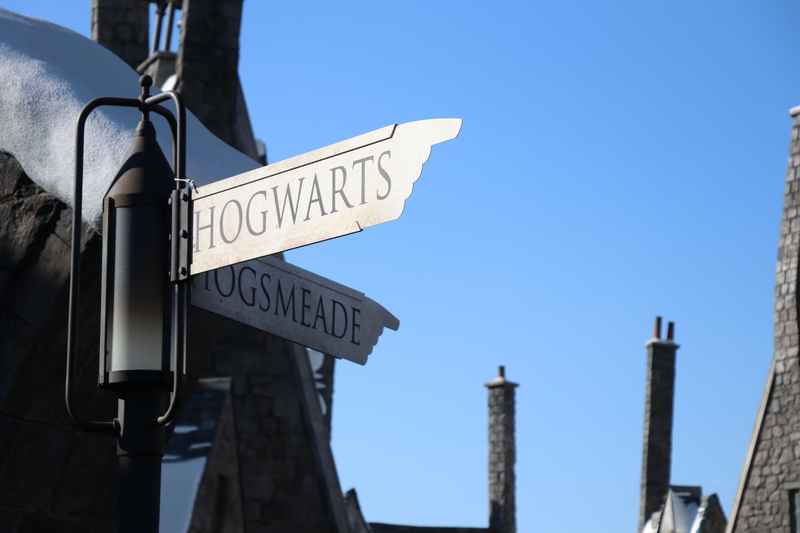 We usually aren’t big fans of mazes trying to incorporate more than one IP or movie for that matter. 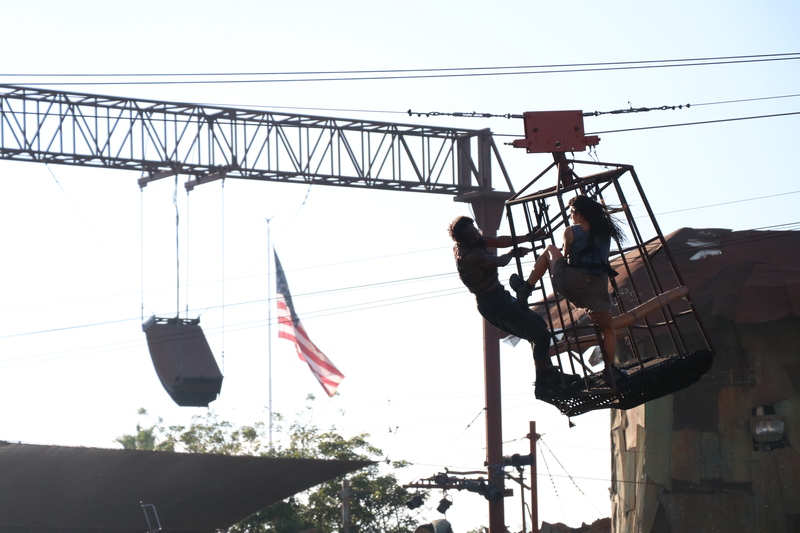 Simply because we never feel like each movie gets its fair share of maze. 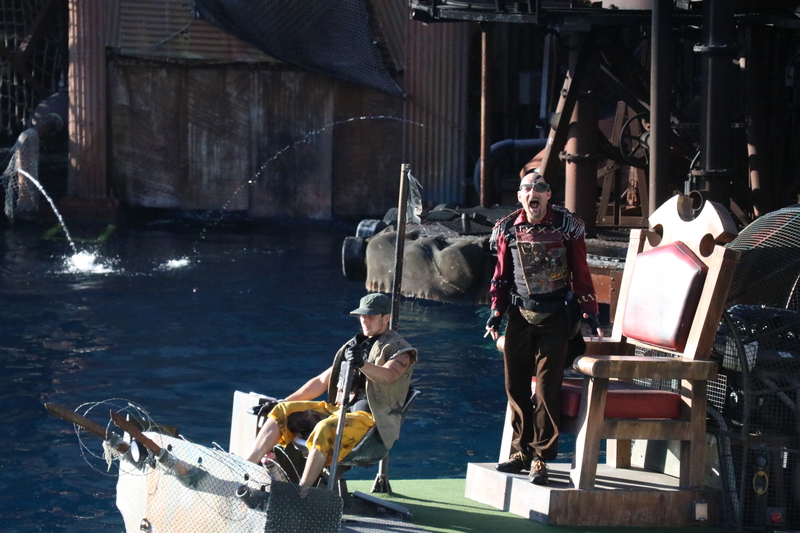 But, we could be proven wrong with this attraction! 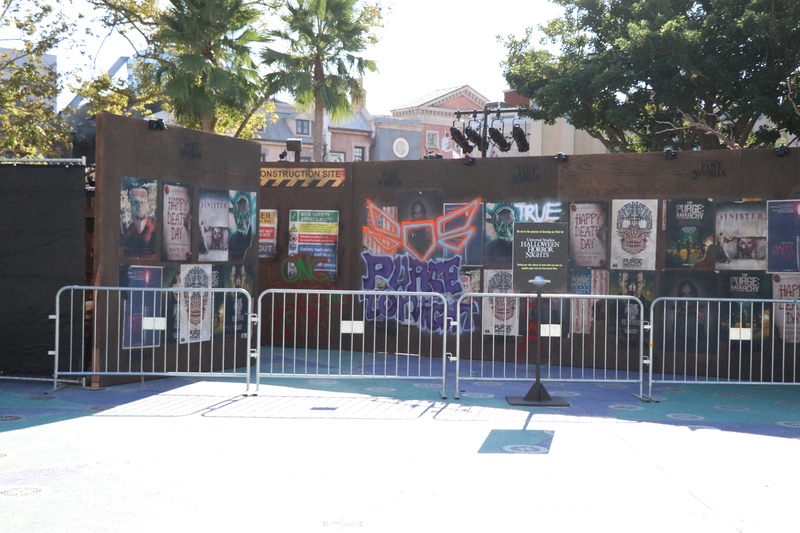 Looks like the stages have been set (literally) for the dancers that greet guests as they enter HHN. 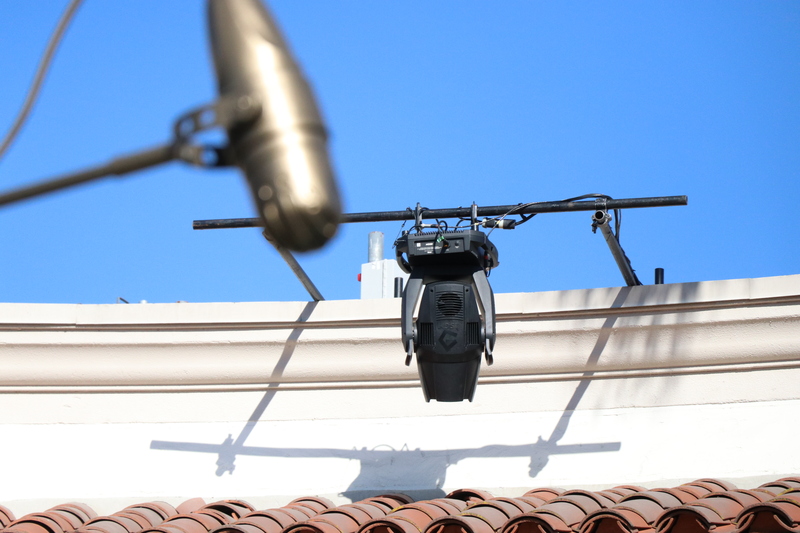 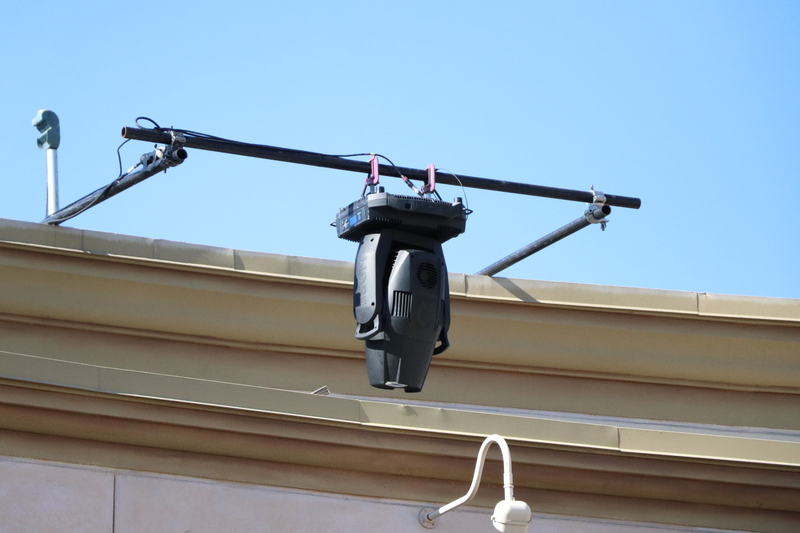 Also, many of the lighting fixtures have been put into place and have been used for rehearsals. 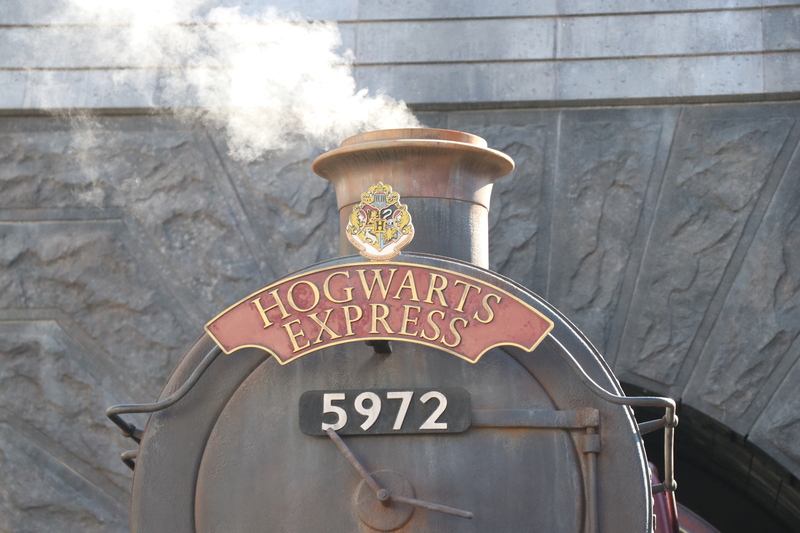 It is so close we can almost taste it! 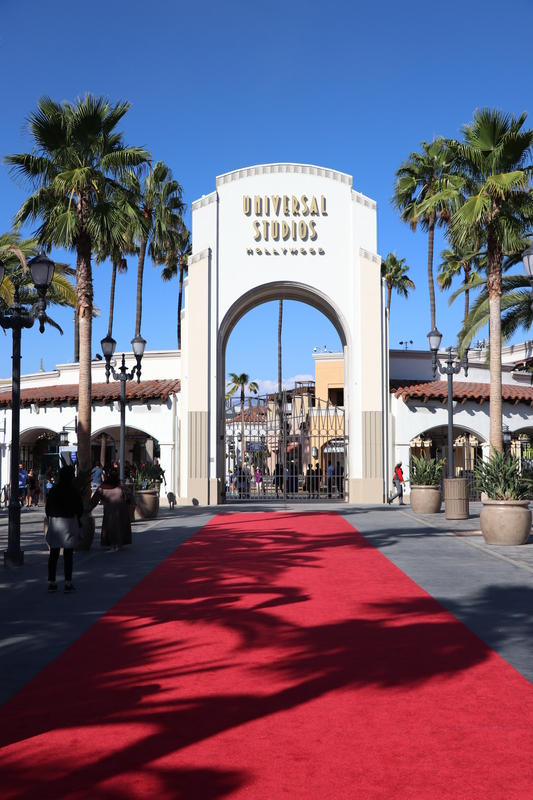 Well we hope you enjoyed a quick trip to Universal Studios Hollywood! 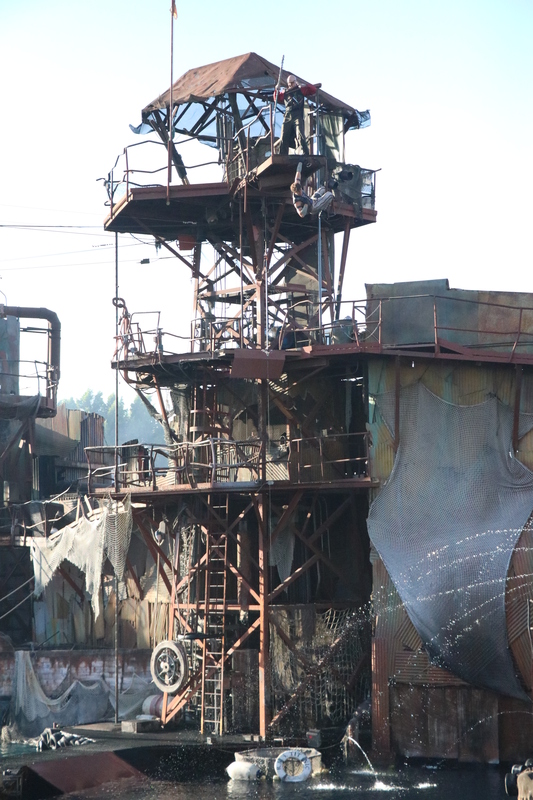 We always love watching the park develop more and more into what its true potential is. 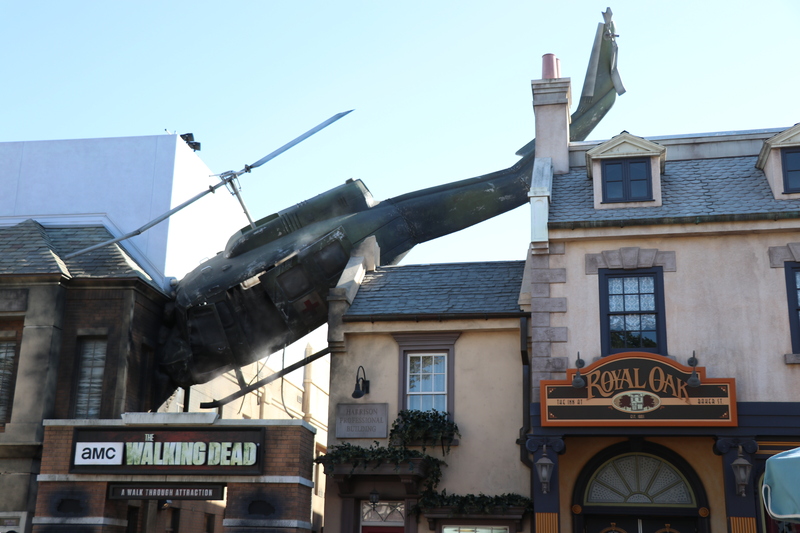 Also during this time of year, it is so fun to see all these incredible haunted attractions come to life! 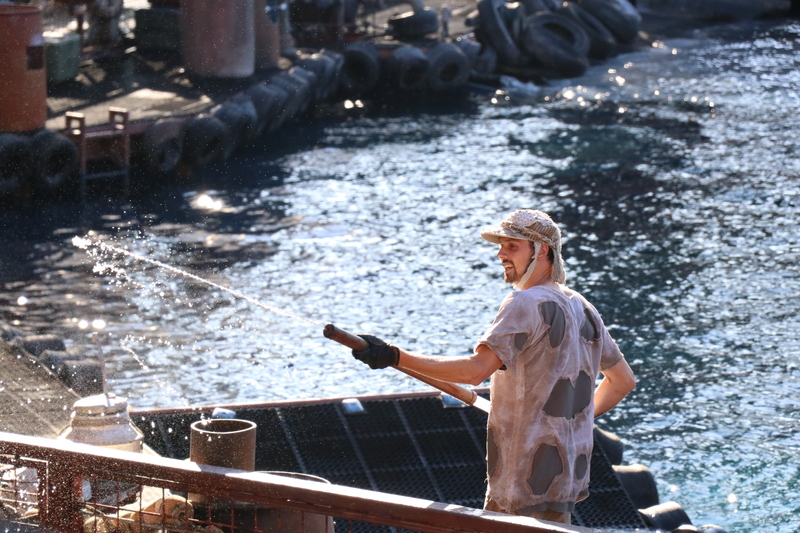 Especially when we get to walk through them so soon!